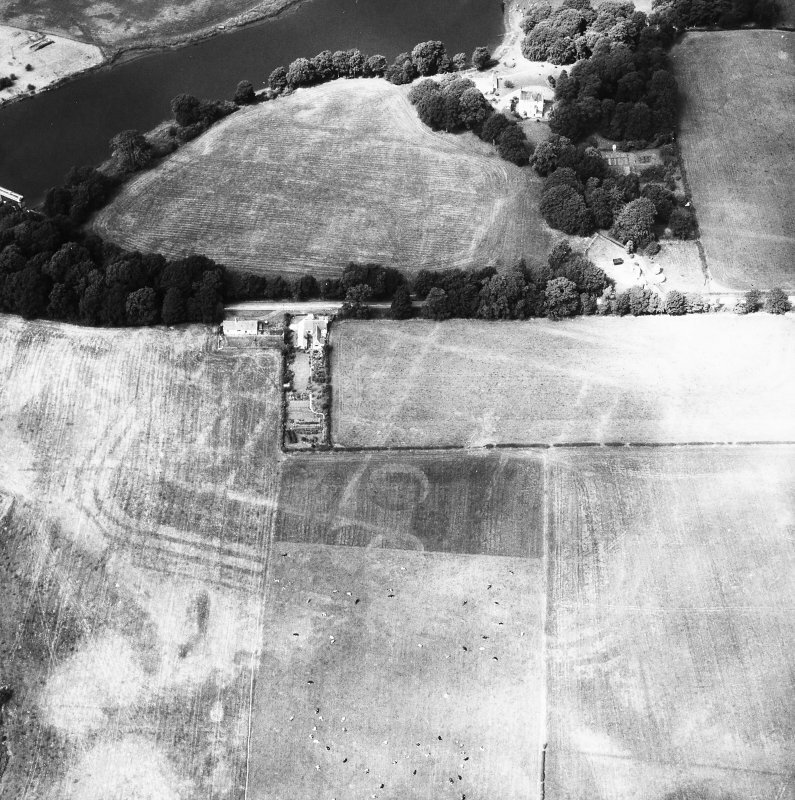 Oblique aerial view of Glenlochar, taken from W, centered on roman fort. 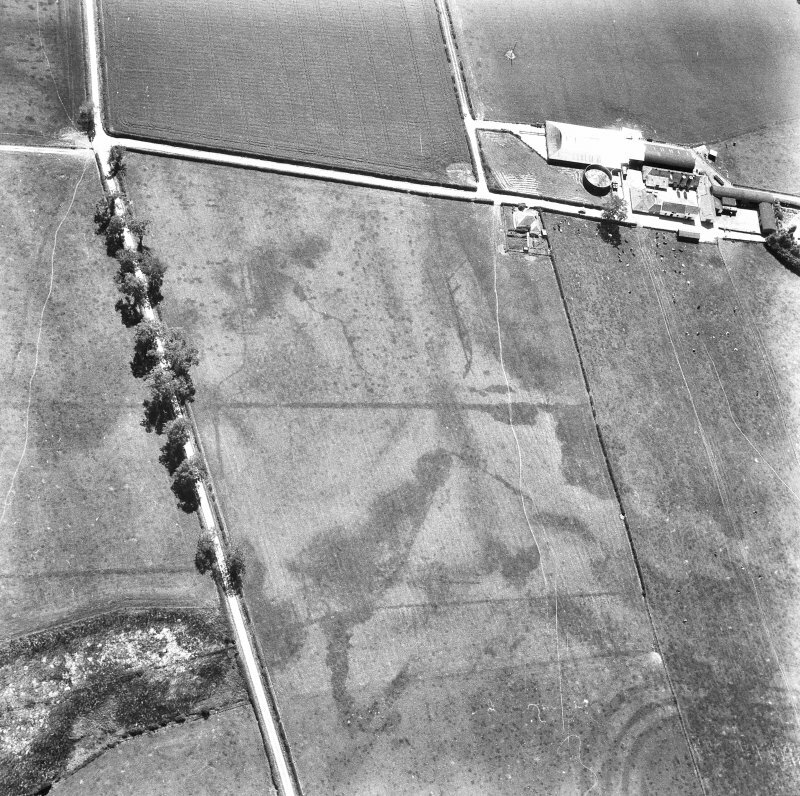 Oblique aerial view centred on the cropmarks and parchmarks of the Roman Fort, taken from the WSW. 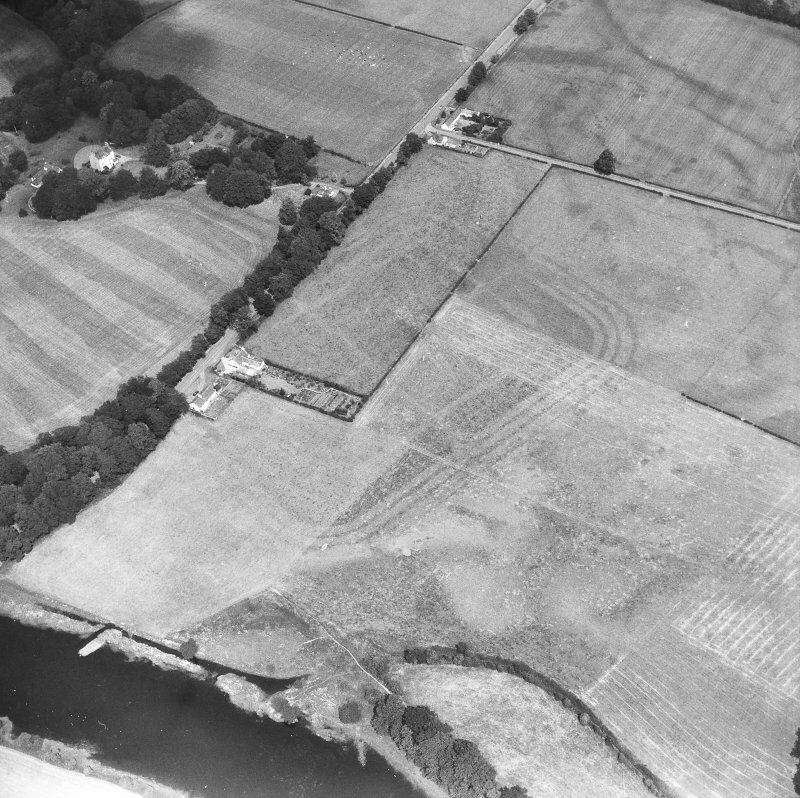 Oblique aerial view of Glenlochar, taken from N, centered on roman fort. 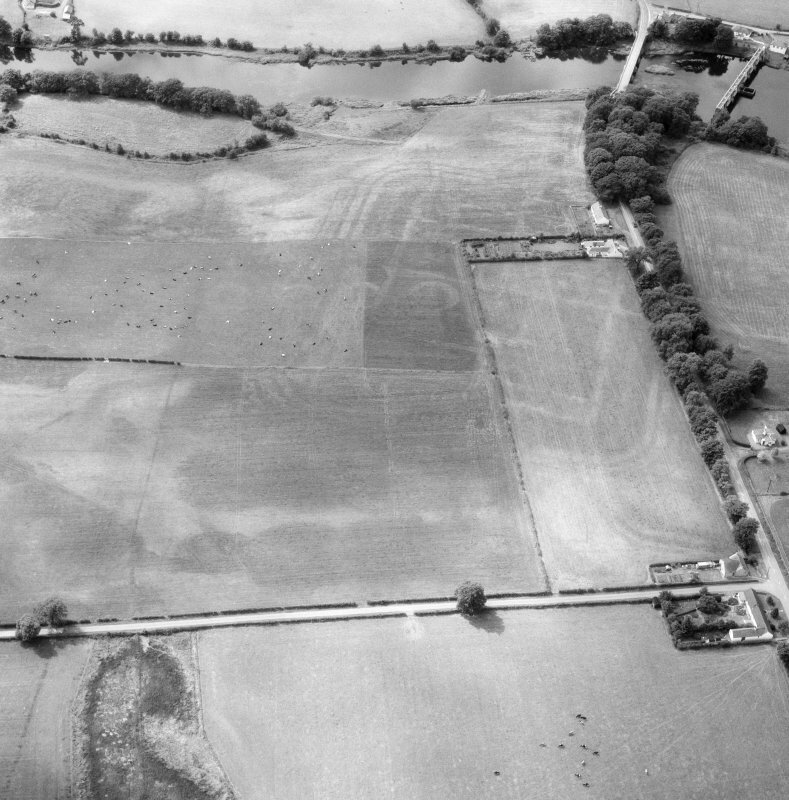 Oblique aerial view of Glenlochar, taken from NE, centered on roman fort. 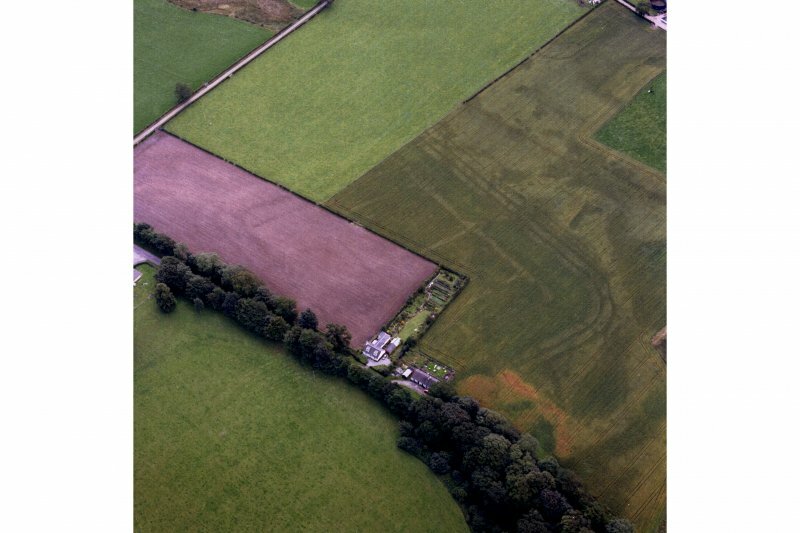 Oblique aerial view of Glenlochar, taken from SSW, centered on roman fort. 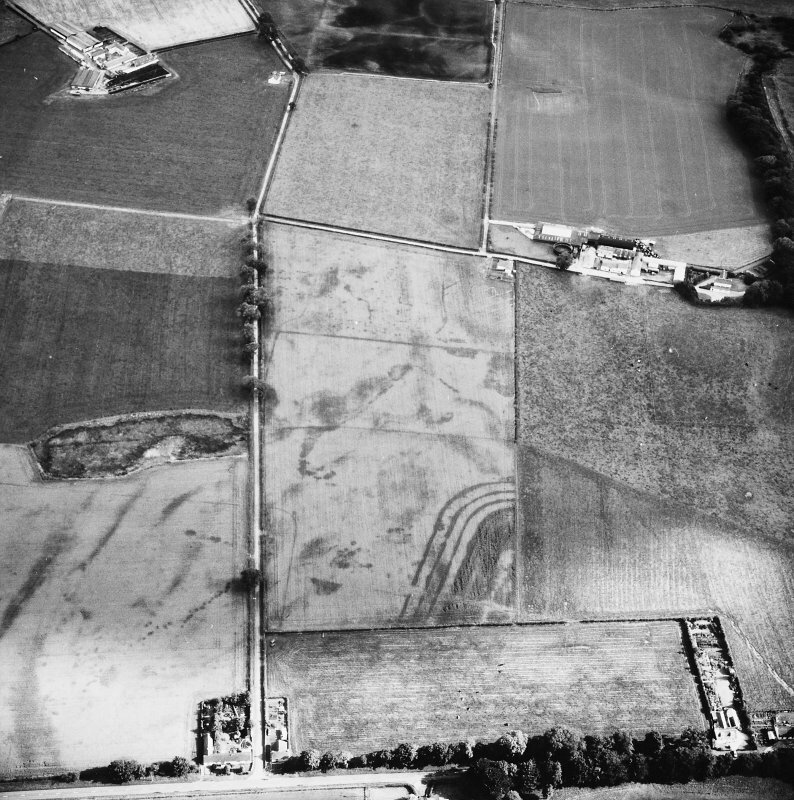 General oblique aerial view of the cropmarks of the Roman Fort,Roman Temprary Camp and pits at Glenlochar, taken from the NE. 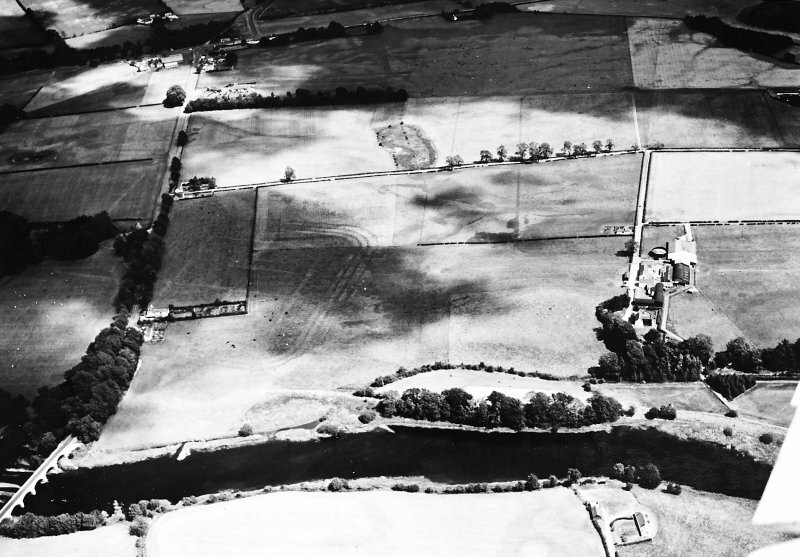 Oblique aerial view of Glenlochar, taken from SE, centered on roman fort. 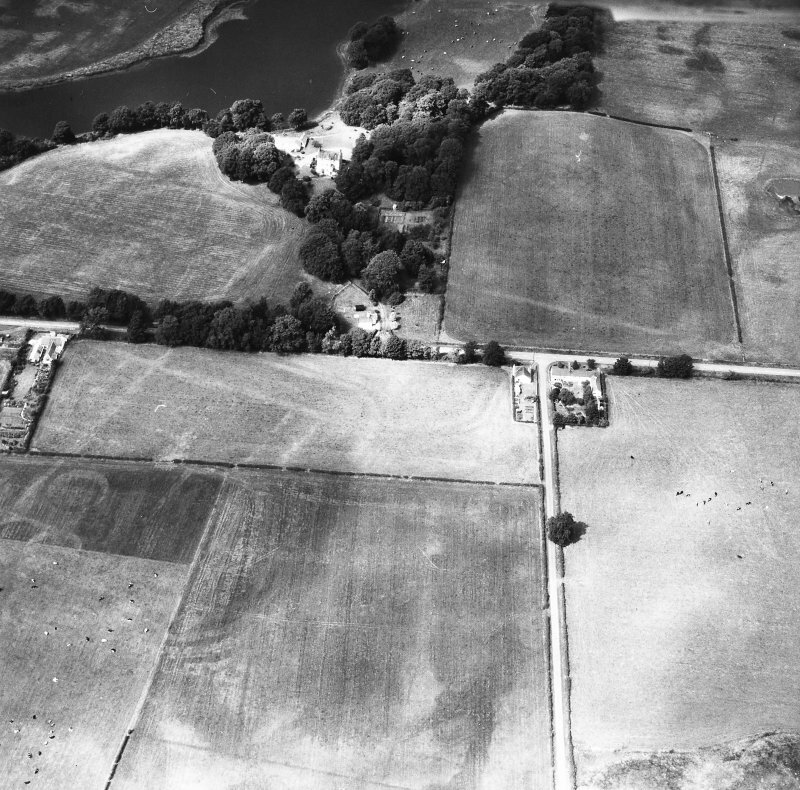 Oblique aerial view of Glenlochar, taken from NW, centered on roman fort. 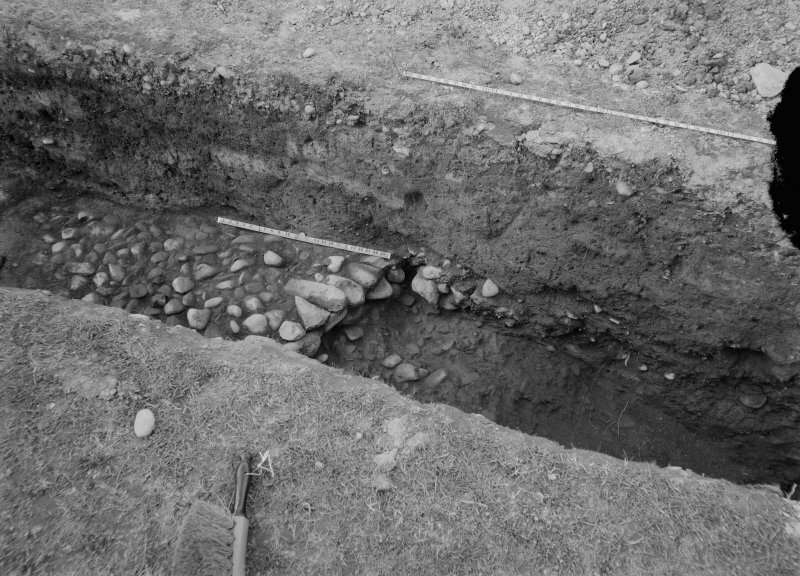 Principia at Glenlochar Roman Fort. 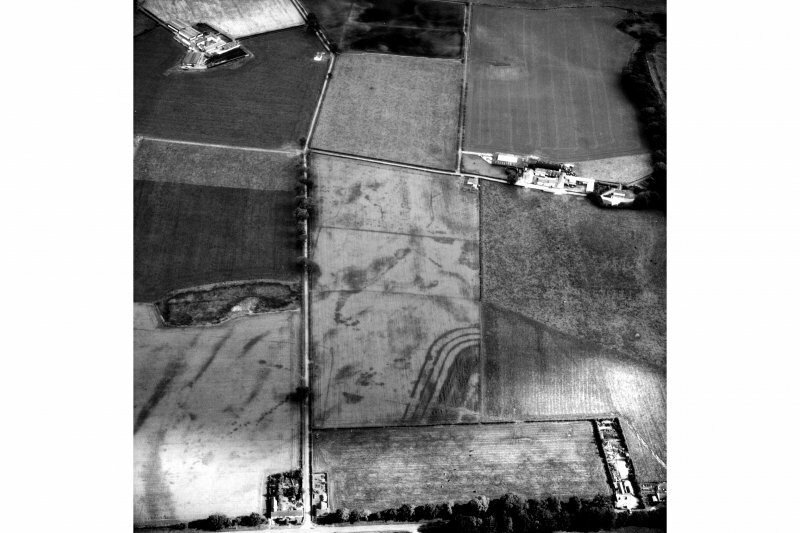 Oblique aerial view centred on the cropmarks and parchmarks of the Roman Fort, taken from the SSW. 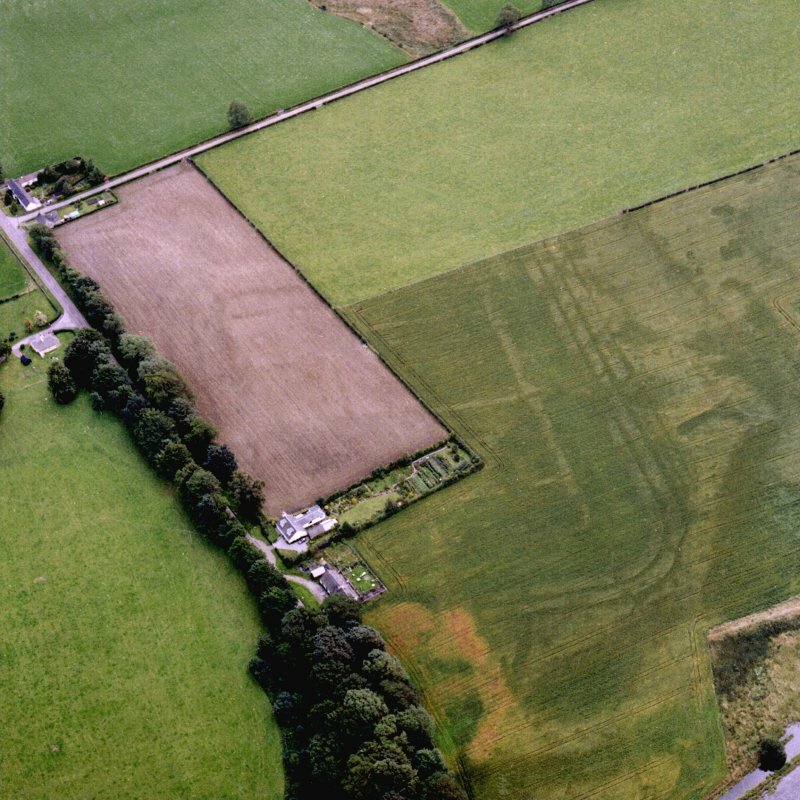 Oblique aerial view of Glenlochar Roman Fort. 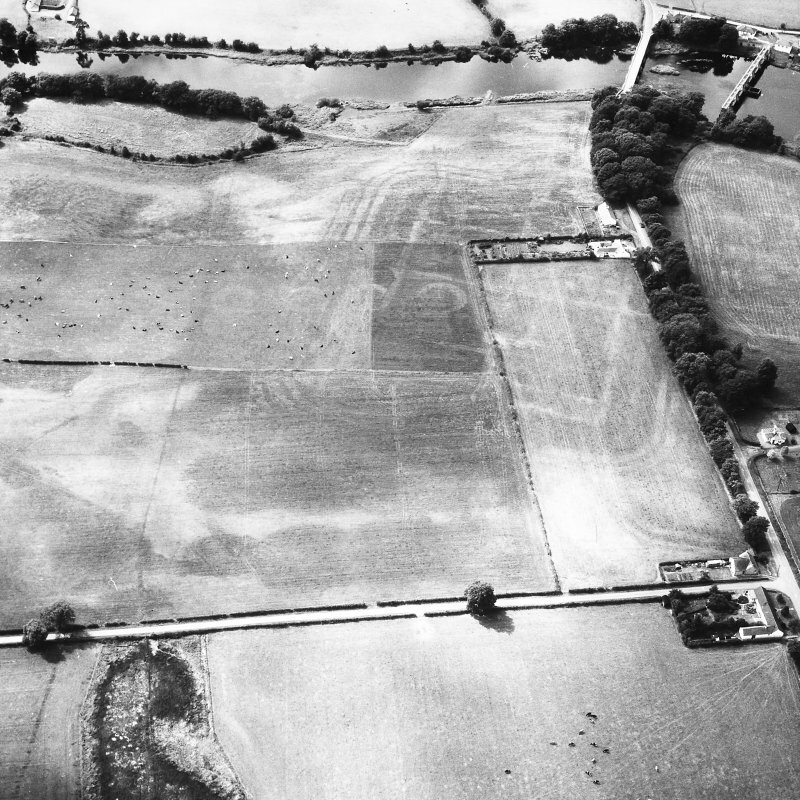 The site of a Roman Fort. 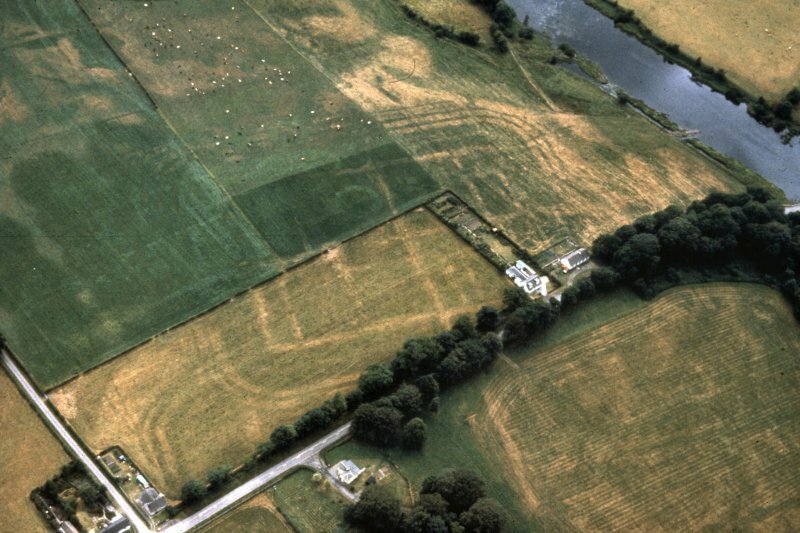 The idea of an Abbey started with the OSA and is based on a mis-interpretation of the Roman remains. 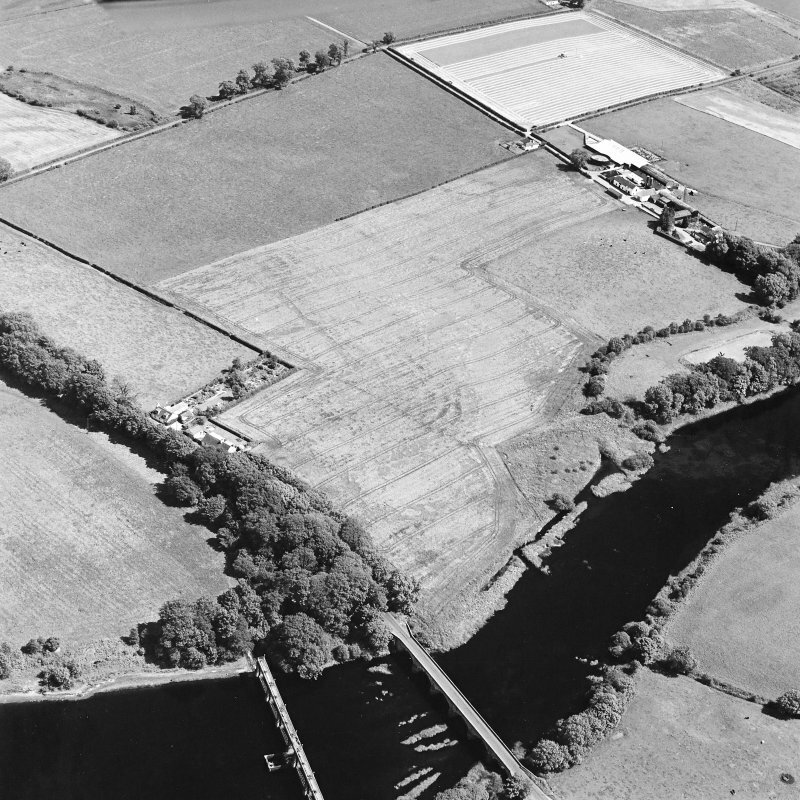 Information from A Graham, RCAHMS, 28 December 1950. 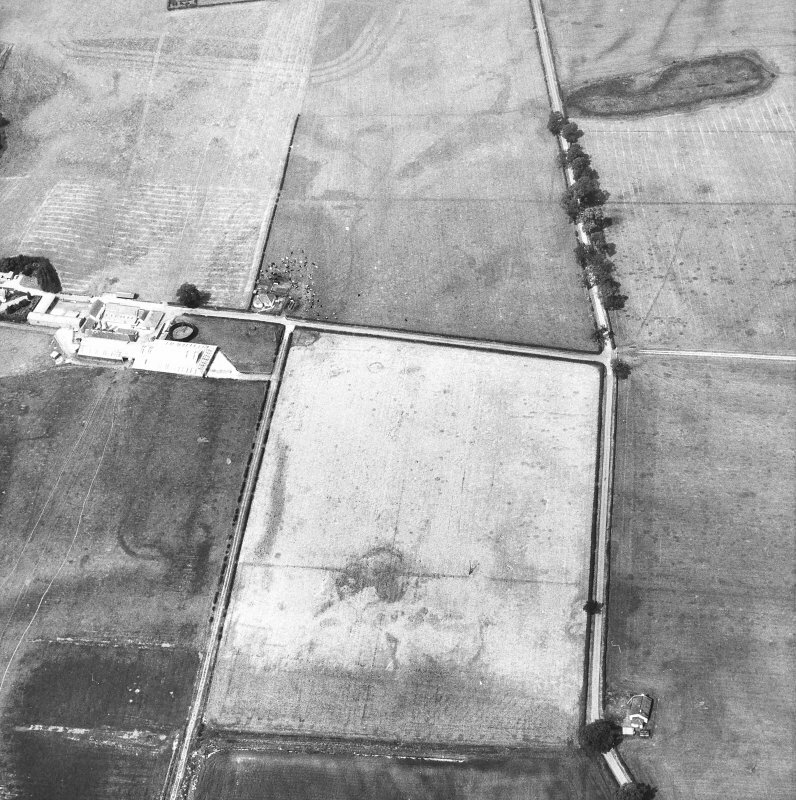 The fort accompanied by a series of temporary camps was identified by Dr St Joseph in 1949 (information from J K St Joseph letter 1949). 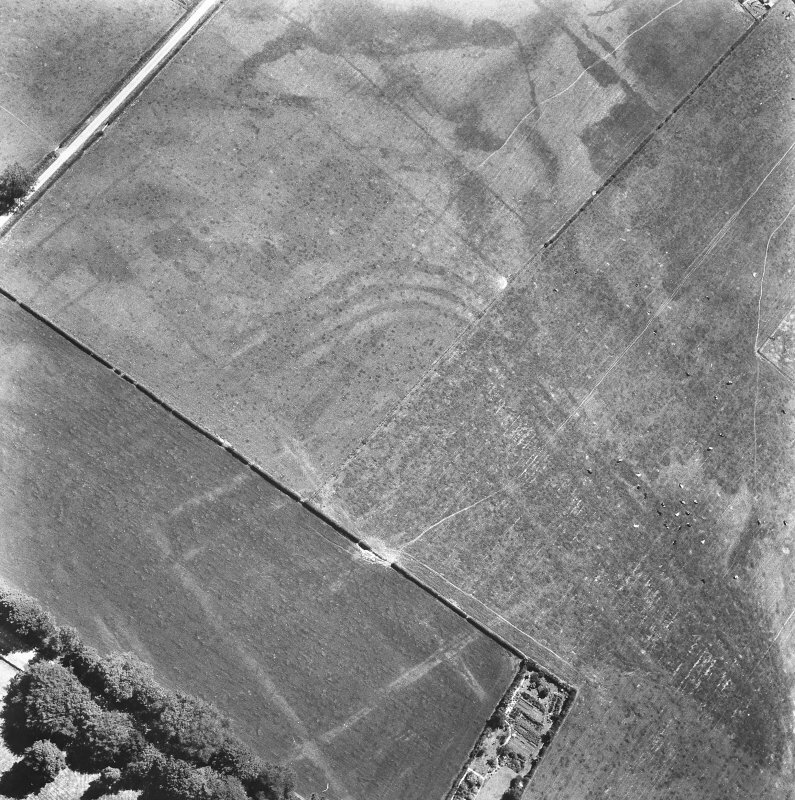 A trial section dug in 1952 revealed that there had been three superimposed forts, which coincided over the greater part if not the whole of the circuit. 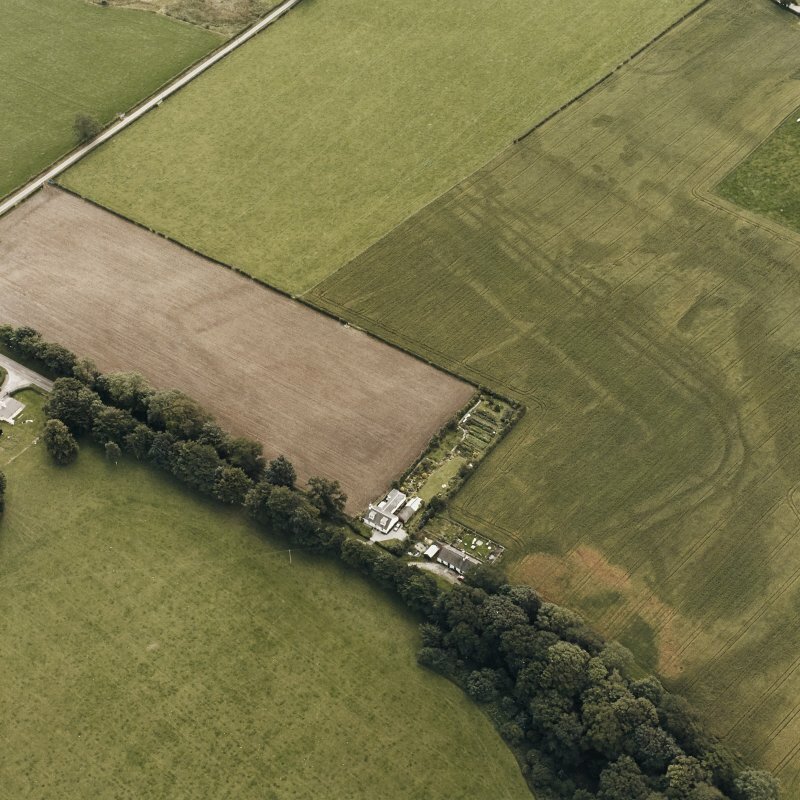 The first had been Flavian and had been destroyed by fire; the second was Antonine and the third was a later Antonine modification of the second. 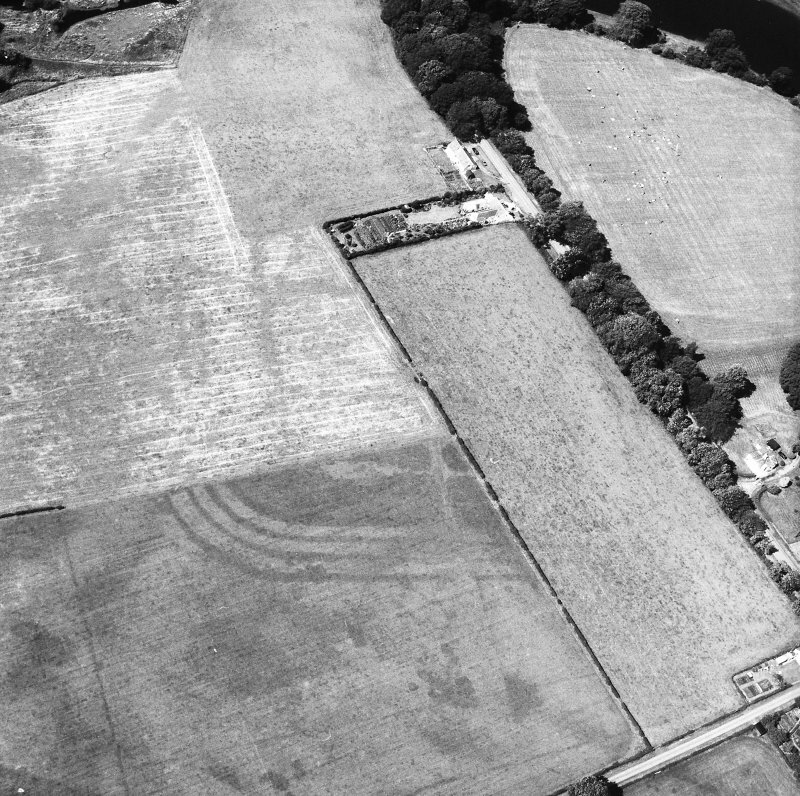 There was an annexe on the north side. 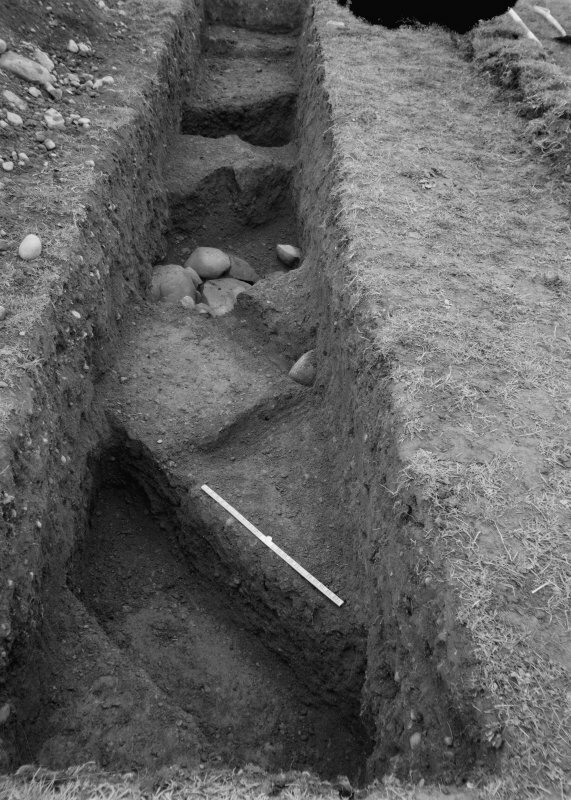 Beneath the Flavian fort were the rubbish pits and shacks which were shown at Newstead to exist outside a garrisoned fort. 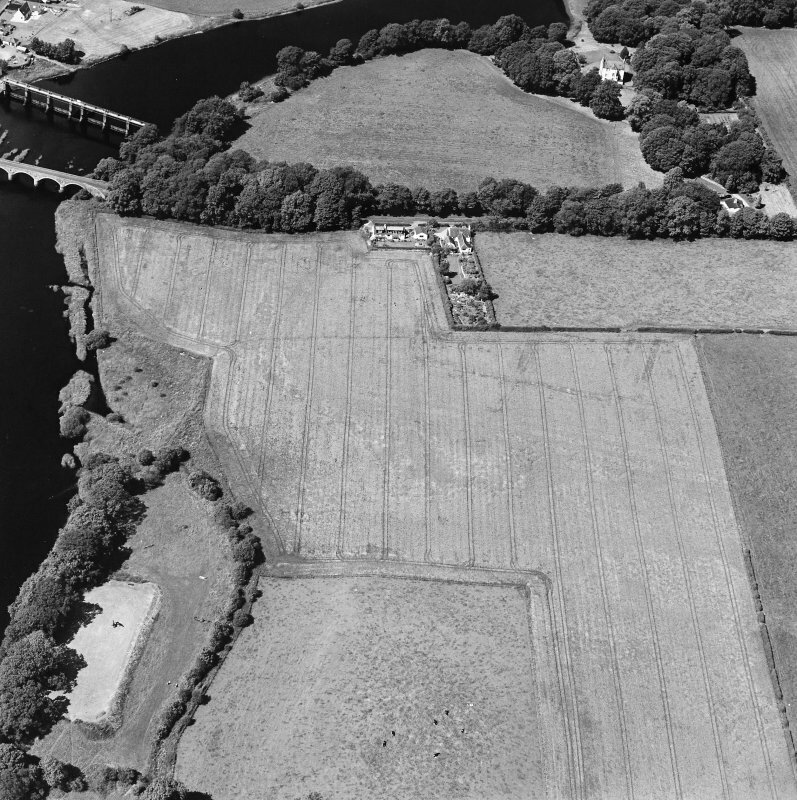 This suggests that there was an earlier Flavian fort at Glenlochar on a different site. 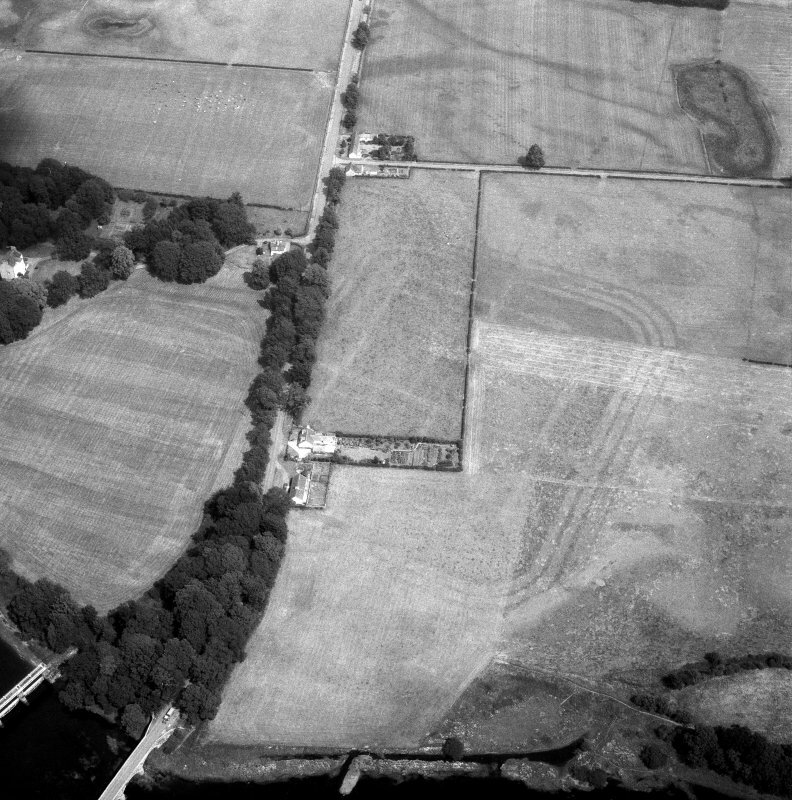 The large ditch, which shows on APs at the northern end of the plateau, west of Glenlochar House and well beyond the limits of the Antonine annexe; and the fact that the main Roman road from the east makes for this area and not the later fort, suggest that the earliest site may prove to be north of the modern road on the highest and driest land. 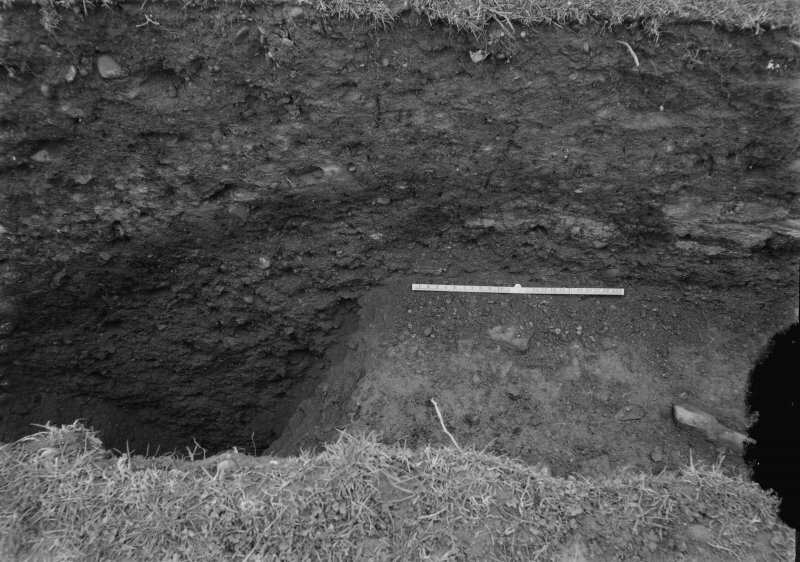 To judge by the extents of the pits this fort would undoubtedly be Agricolan. 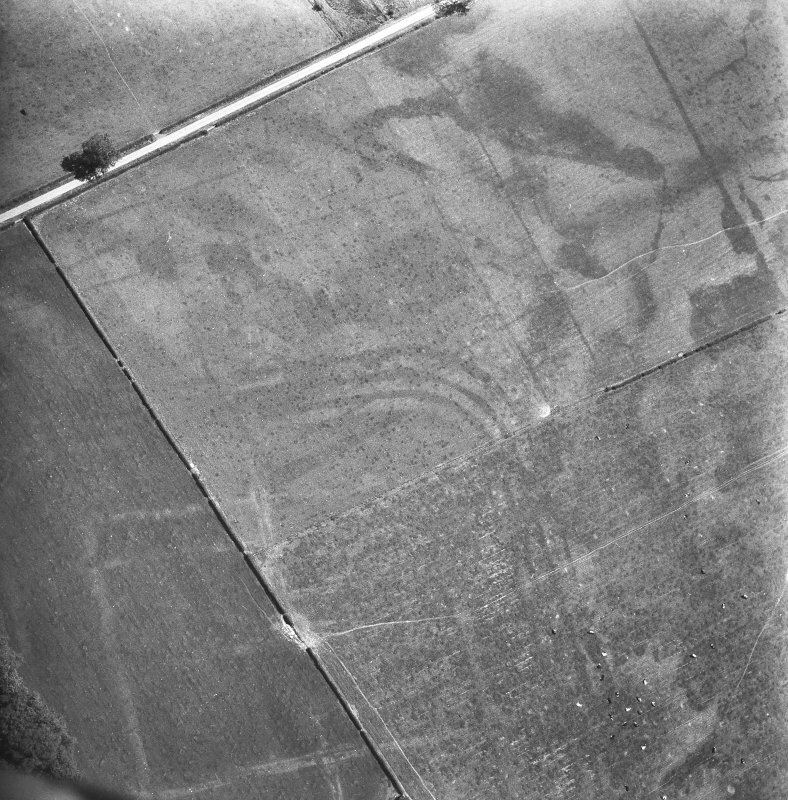 Six or seven camps associated with the forts have been identified (J K St Joseph 1958) (see NX76NW 3 and NX76SW 4, NX76SW 5, NX76SW 6 possibly 1). 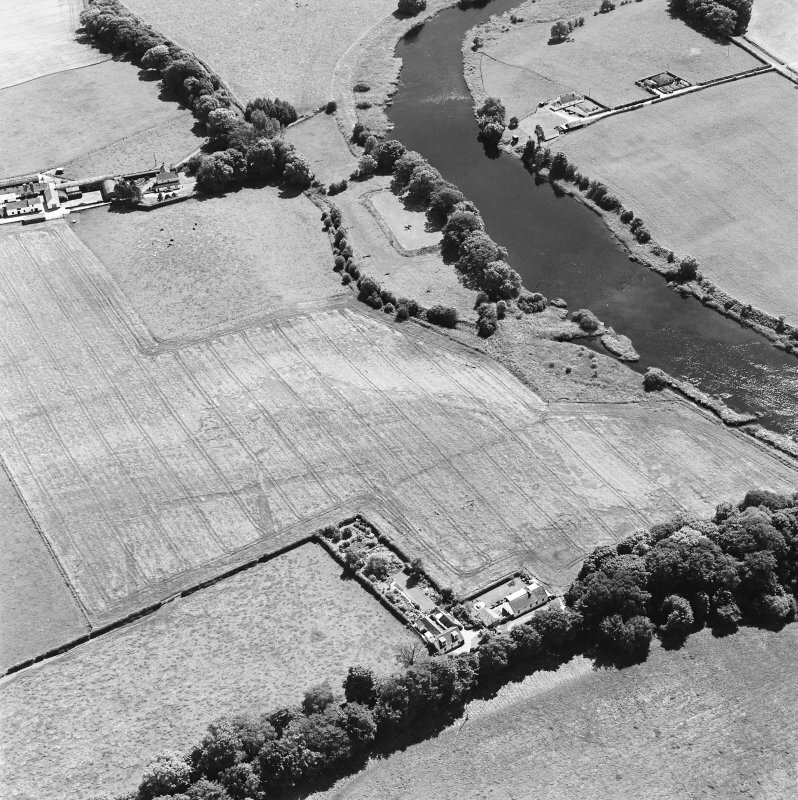 The ditches of the north side of the annexe continue west as far as the bank of the Dee. 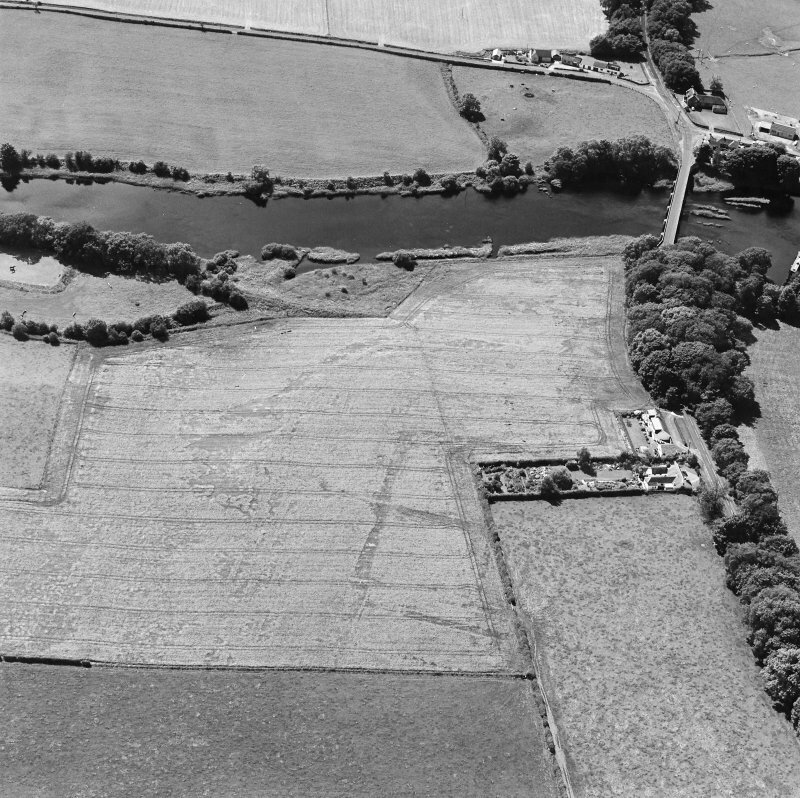 A broad ditch; interupted by a gap for an entrance occurs 200' further north, and perhaps delimits an annexe to one of the Flavian forts. 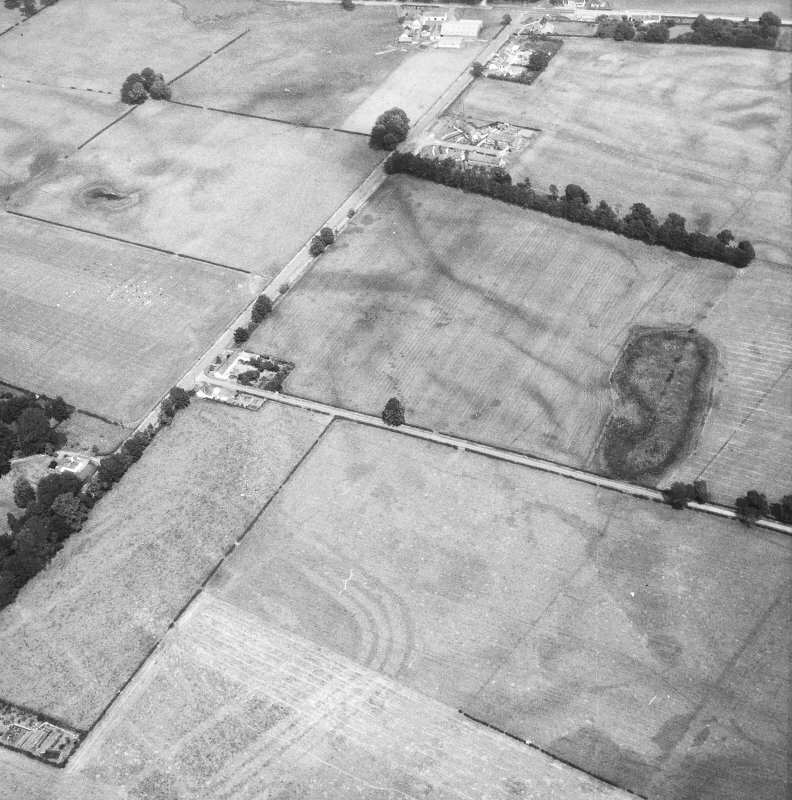 I A Richmond and J K St Joseph 1953; J K St Joseph 1965. 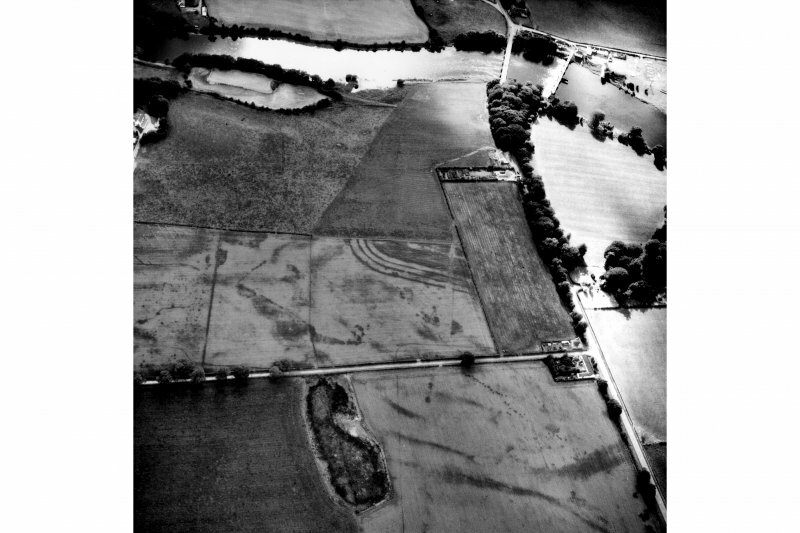 The inner rampart of the fort can still be traced as a low spread unsurveyable mound. 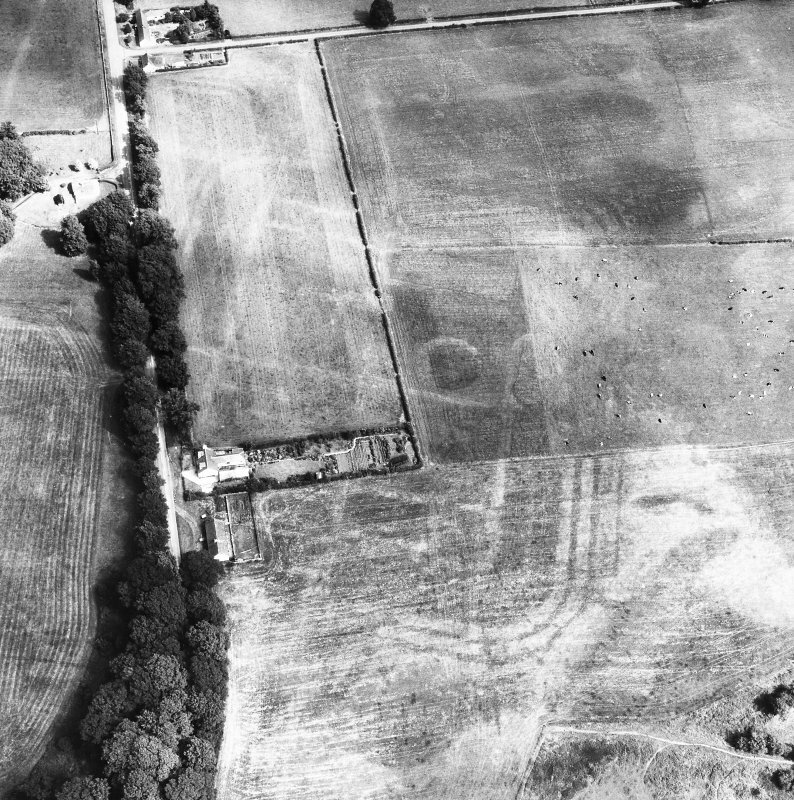 Slight traces of the large ditch to the north can still be seen on the ground but there is insufficient evidence to warrant survey of this or the other slight cropmark which suggest the site of an earlier Flavian fort. 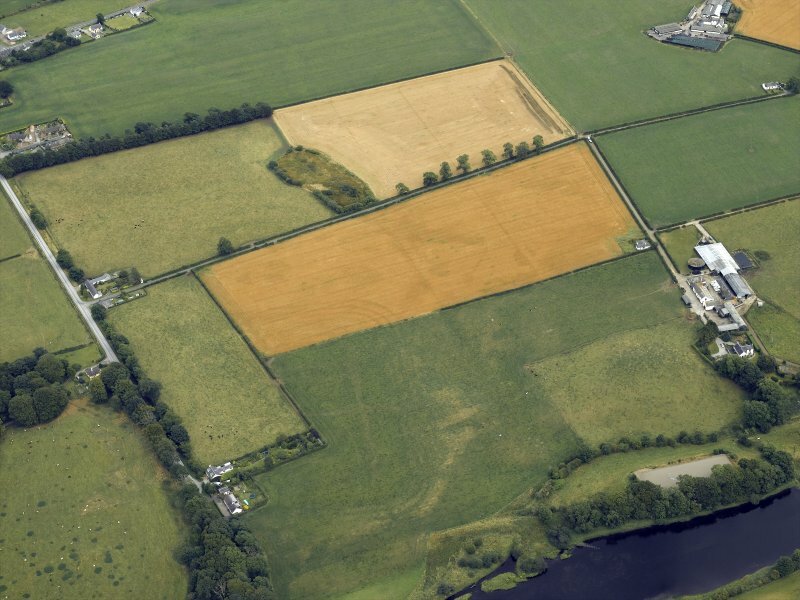 There is no trace on the ground of the annexe or the temporary camps. 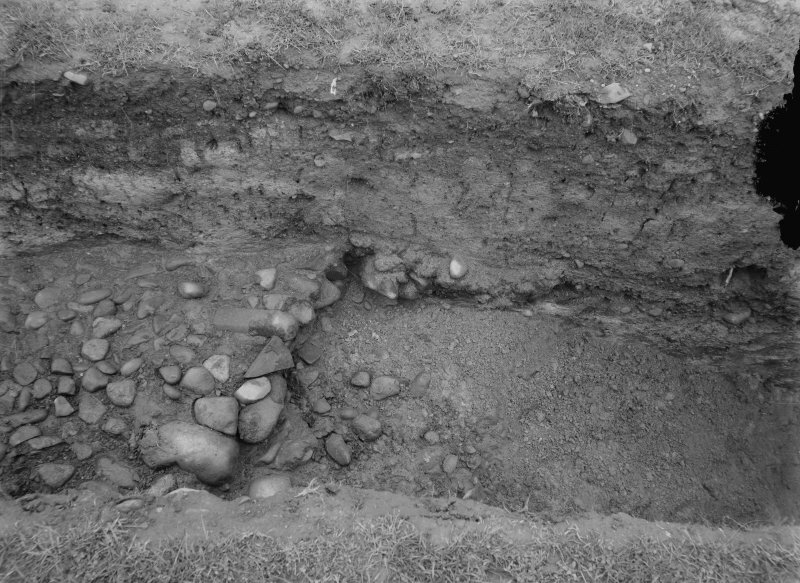 Sites surveyed from St Joseph A Ps and ground observations. 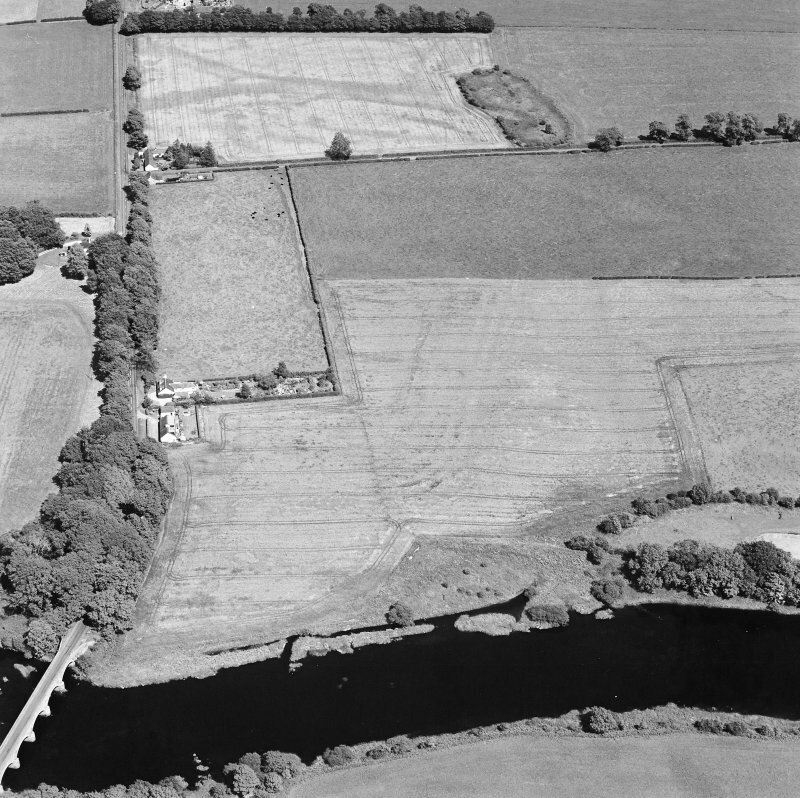 Visited by OS (RD), 30 July 1968. 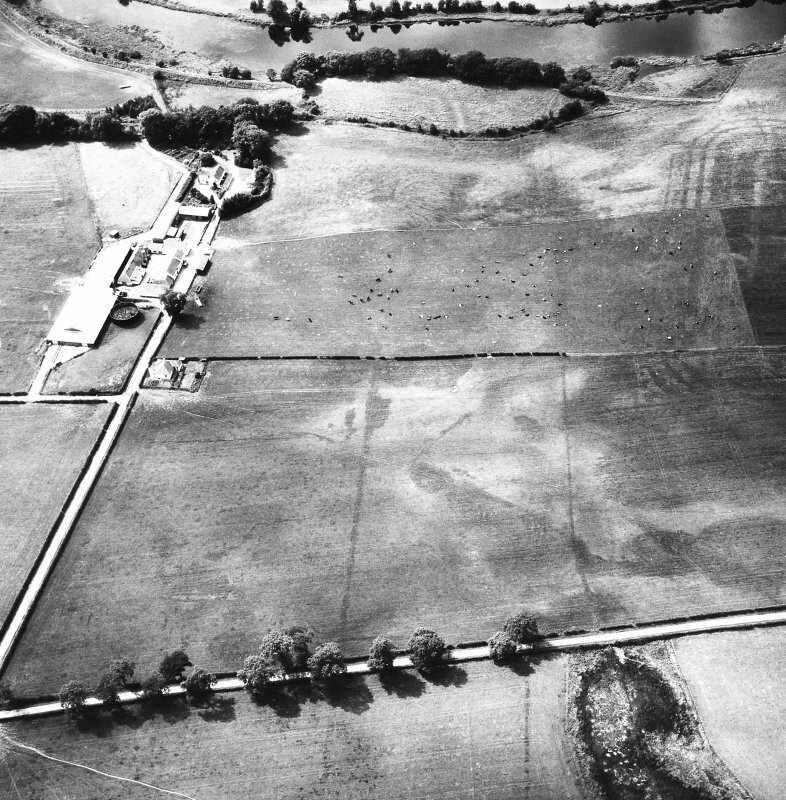 Scheduled (with NX76SW 2-6, 23, 24 and 29) as 'Glenlochar, Roman fort, annexe, road, camps and barrows 50m E of Montford....'. 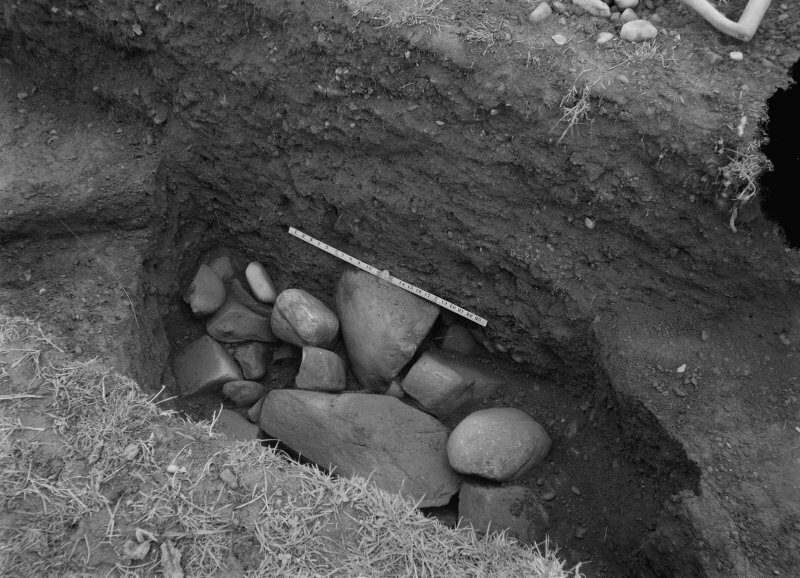 Information from Historic Scotland, scheduling document dated 1 March 2011. 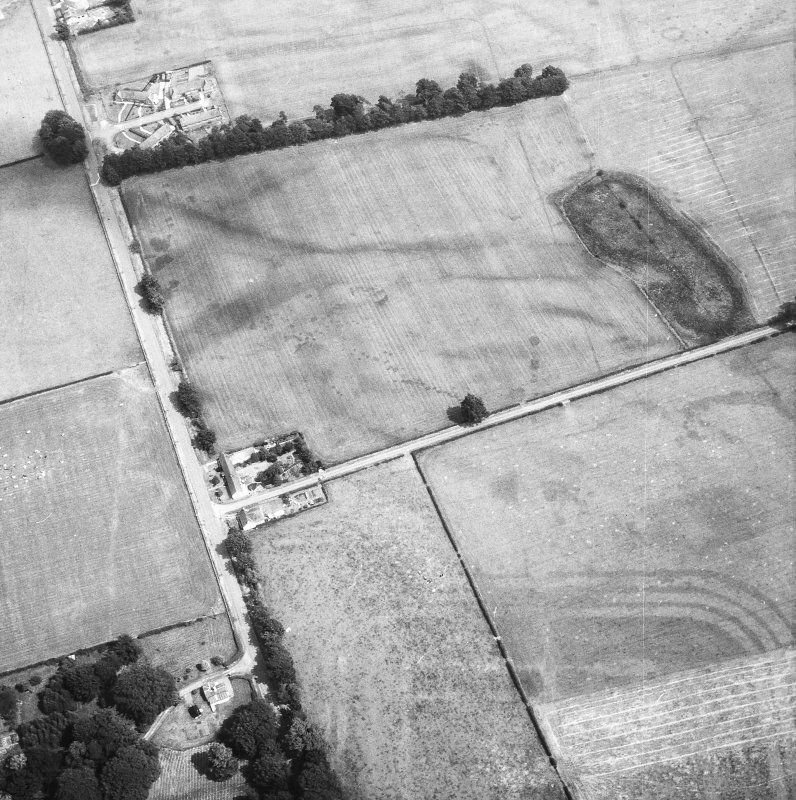 Viewed from the road, which slices its north-western corner, this large fort of 3.3 ha shows up only slightly as a ditched platform. 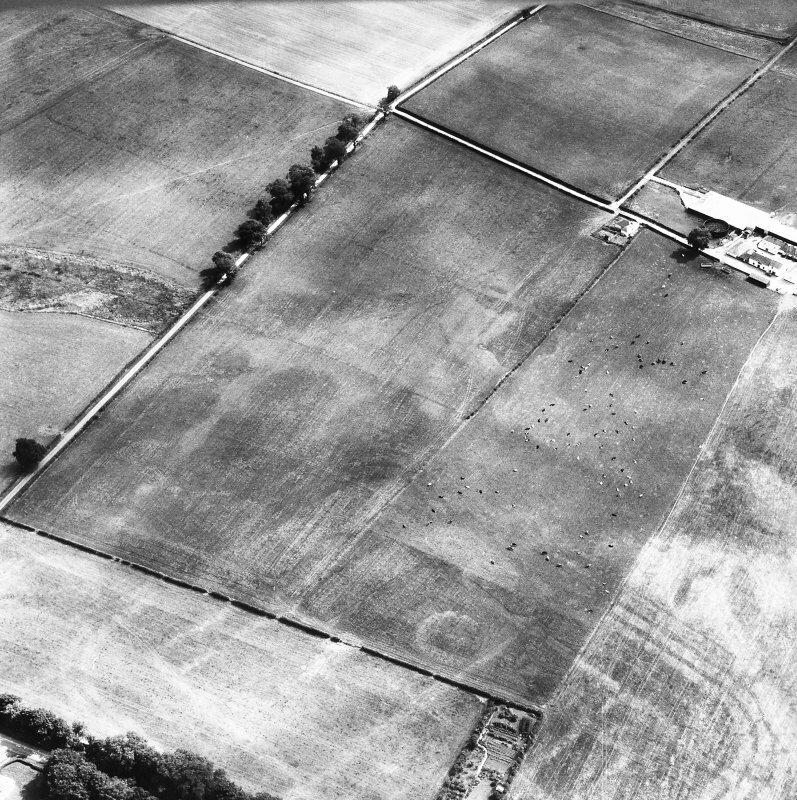 Viewed from the air, which is how it was first identifIed in 1949 (having previously been marked on maps as the supposed site of an abbey), it presents a detailed cropmark of characteristic gridded 'playing card' shape, complete with annexes and at least six temporary camps in the vicinity. 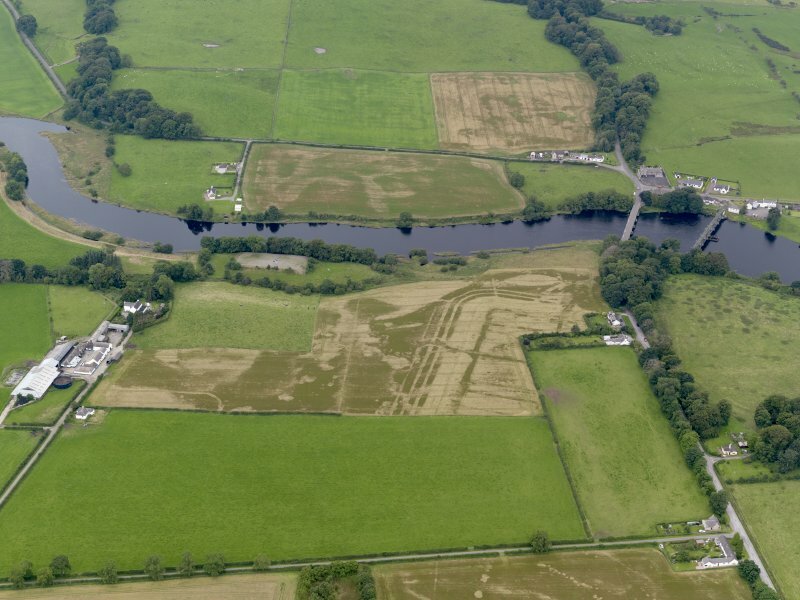 Placed on the east bank of the River Dee, this was obviously a major centre of Roman control in Galloway, the westward limits of which are still unknown beyond Gatehouse (NX 595574). 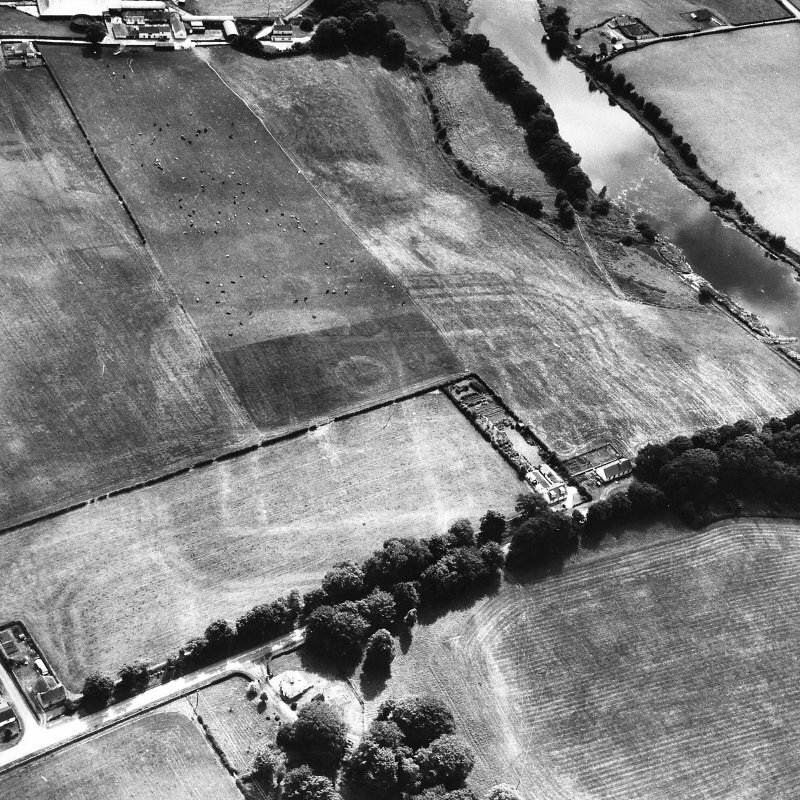 Study of its layout as revealed by aerial photography has suggested comparison with Birrens (no. 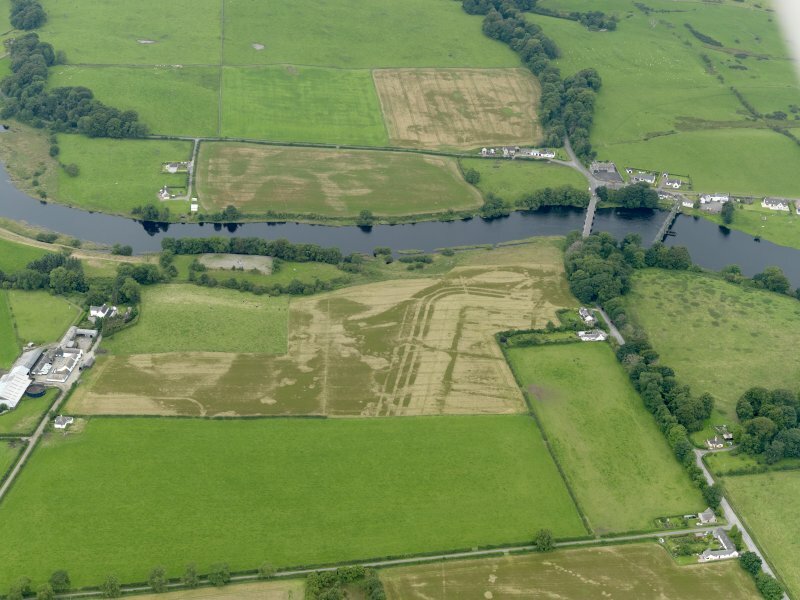 48), and during the Antonine periods it could have housed a similar general purpose garrison, namely, a partmounted milliary unit of the auxiliary army. 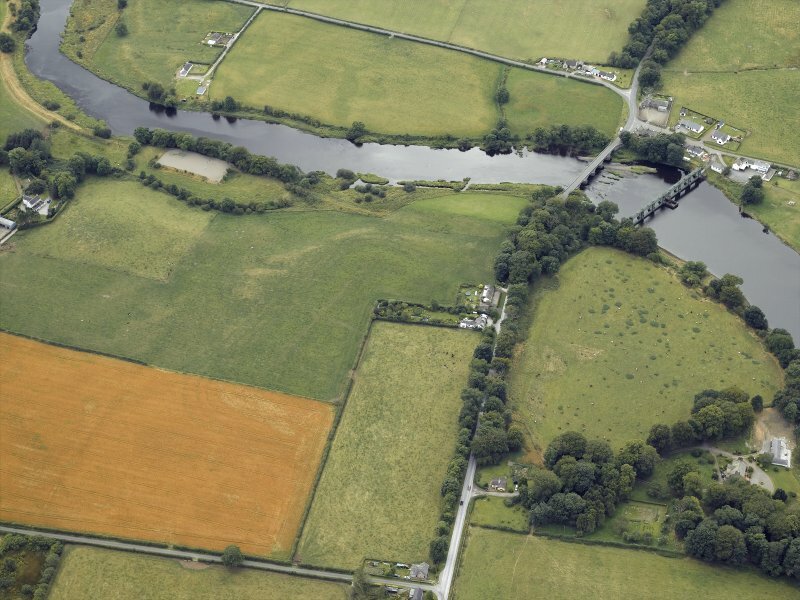 The defences are especially broad. 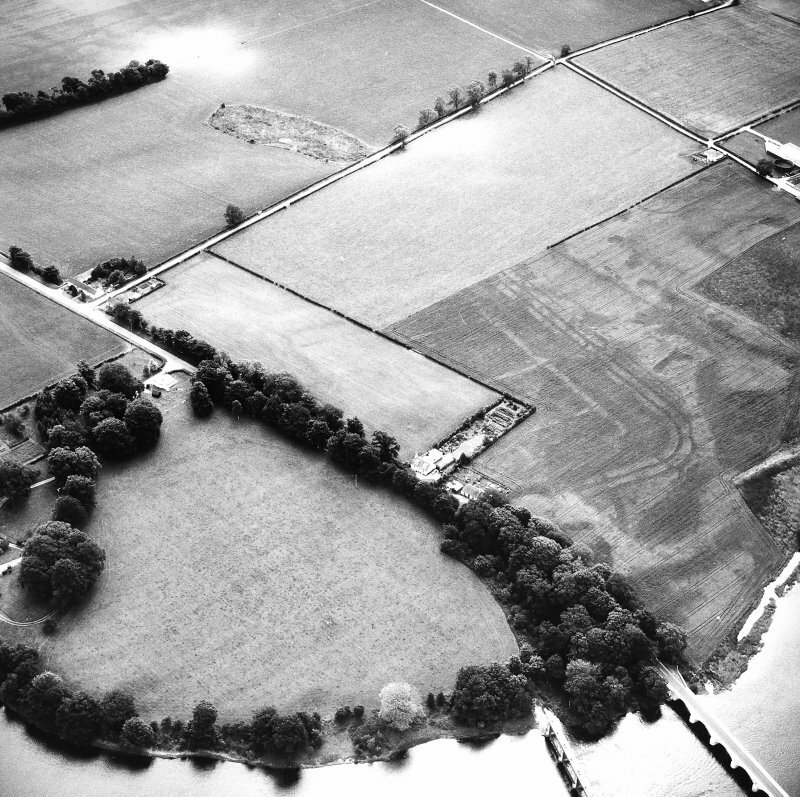 Excavations in 1952 demonstrated a succession of three forts, preceded by an early and temporary Flavian occupation. 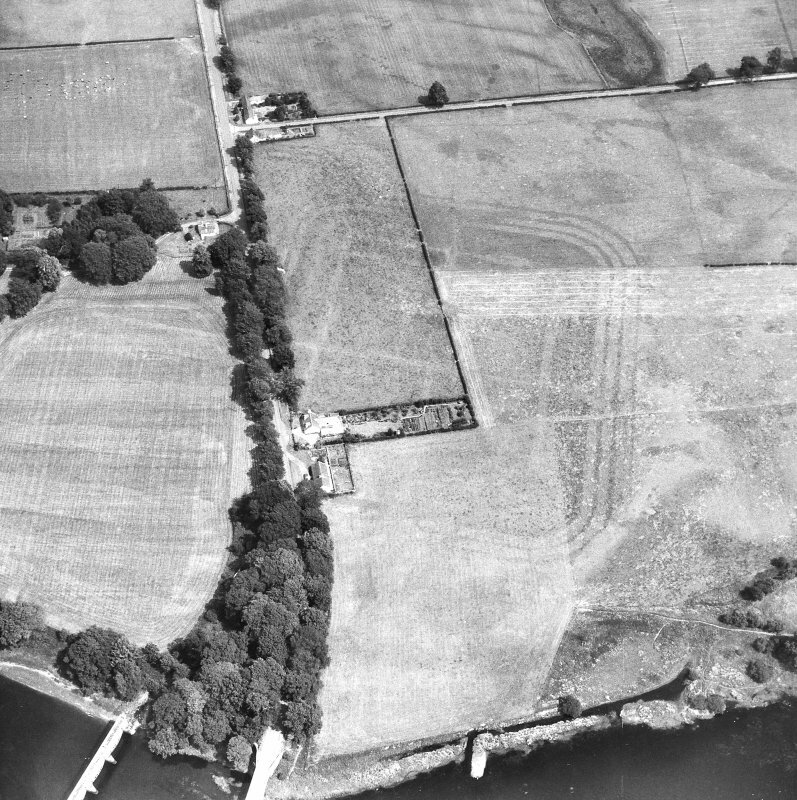 The first, late Flavian (late 1st century), fort may have occupied part of the plateau closer to Glenlochar House, and ended in what was described as 'wholesale conflagration'; it was replaced by a fort of the first Antonine period, later modifIed. 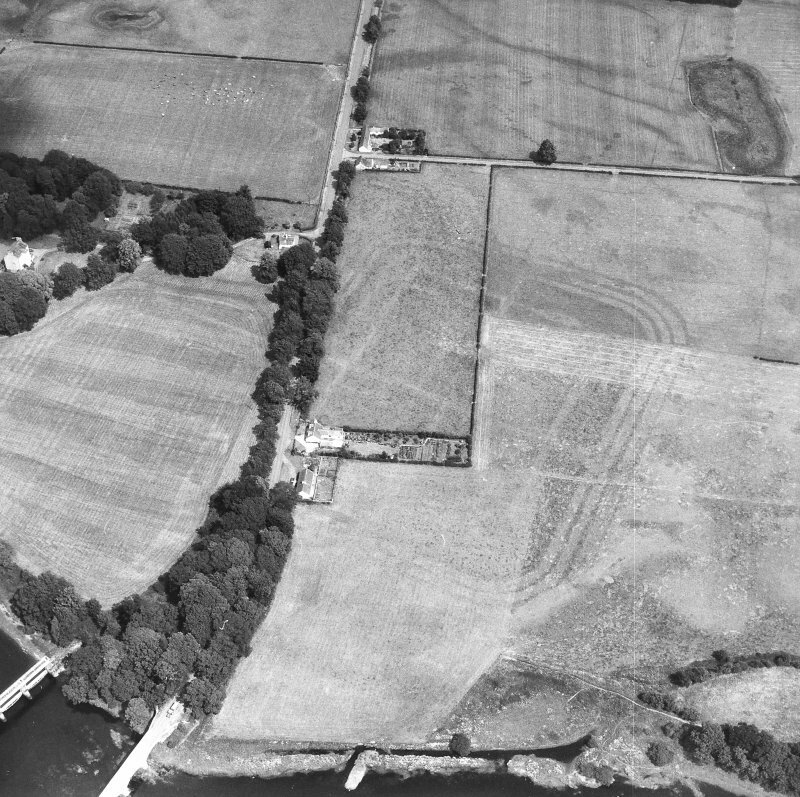 Roman soldiers first entered southern Scotland in the later 1st century AD – tree-ring dating of timbers used to build the fort at Carlisle demonstrates that it was built in about AD 72/3. 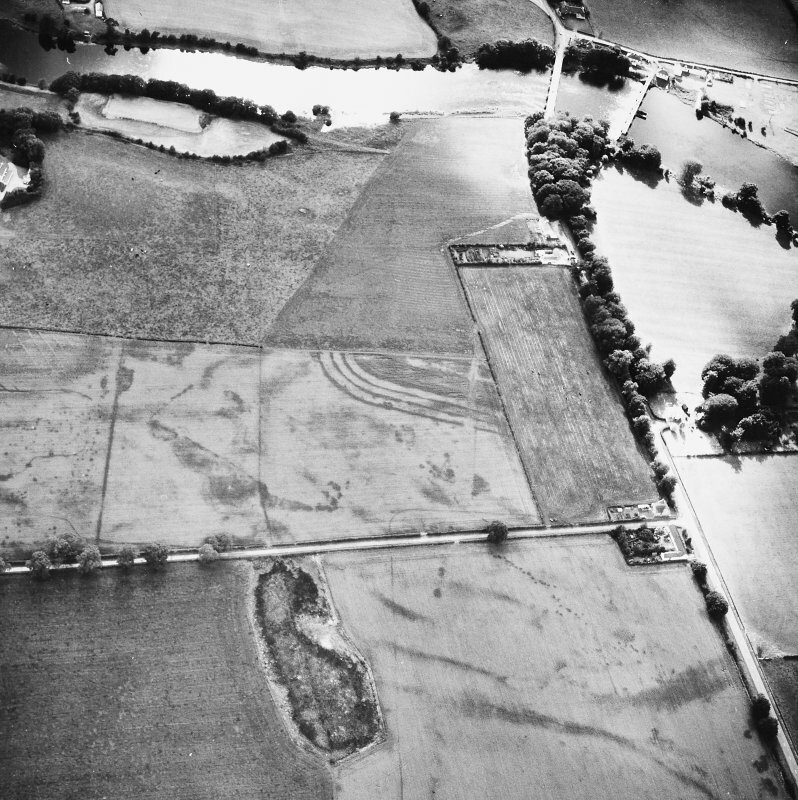 This would have been accompanied by campaigns in the north prior to the push into southern Scotland which came later in the AD 70s. 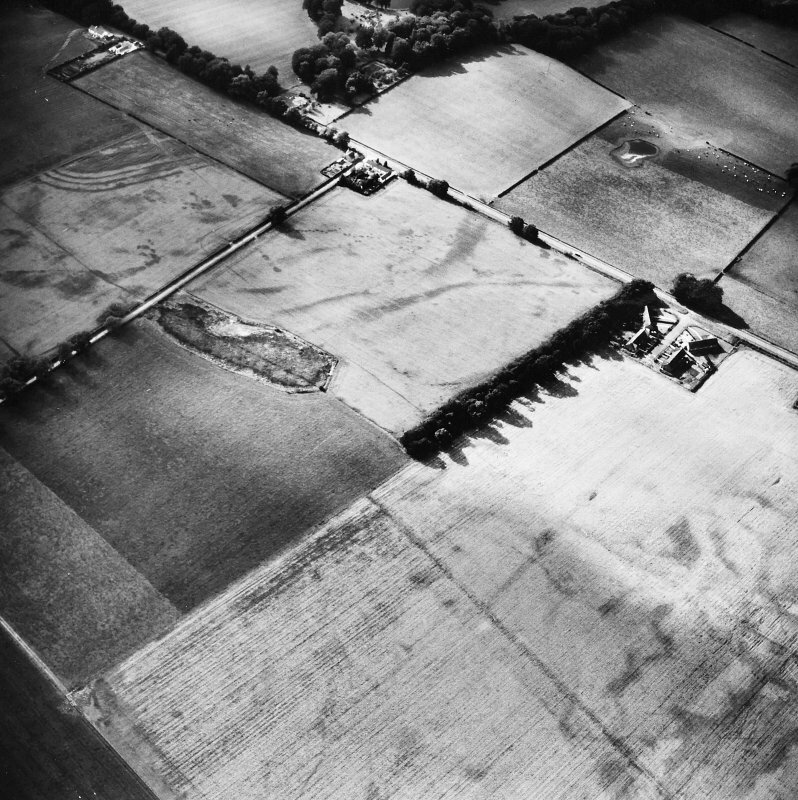 Soldiers on campaign were housed in temporary camps – these were enclosures with a bank and ditch protecting their perimeter, with soldiers housed in rows of tents in the interior. 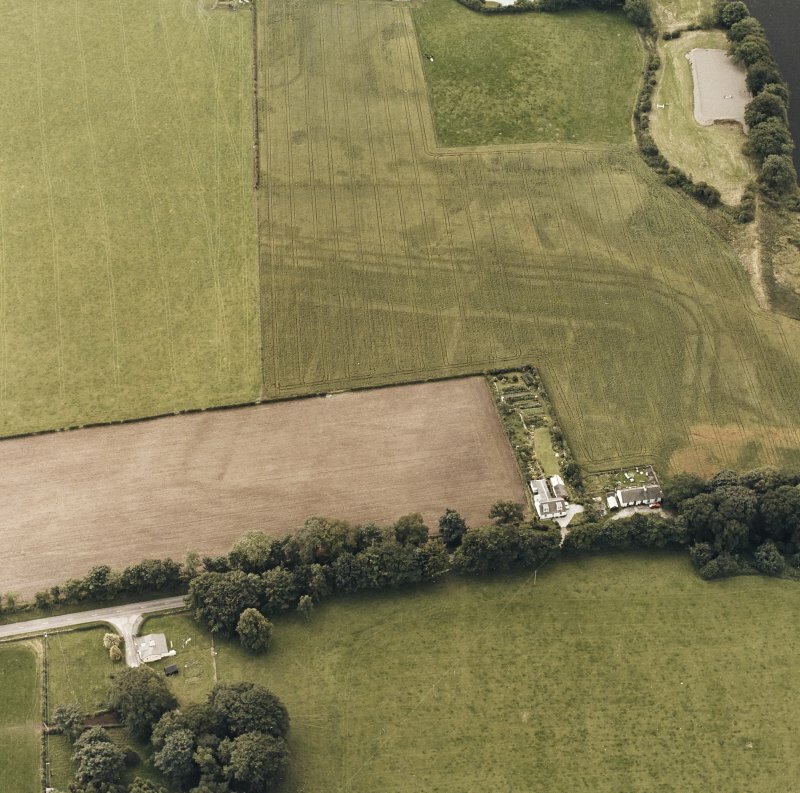 We have evidence for a number of such temporary camps in south-west Scotland, but their distribution is patchy, showing how many must still remain undetected. 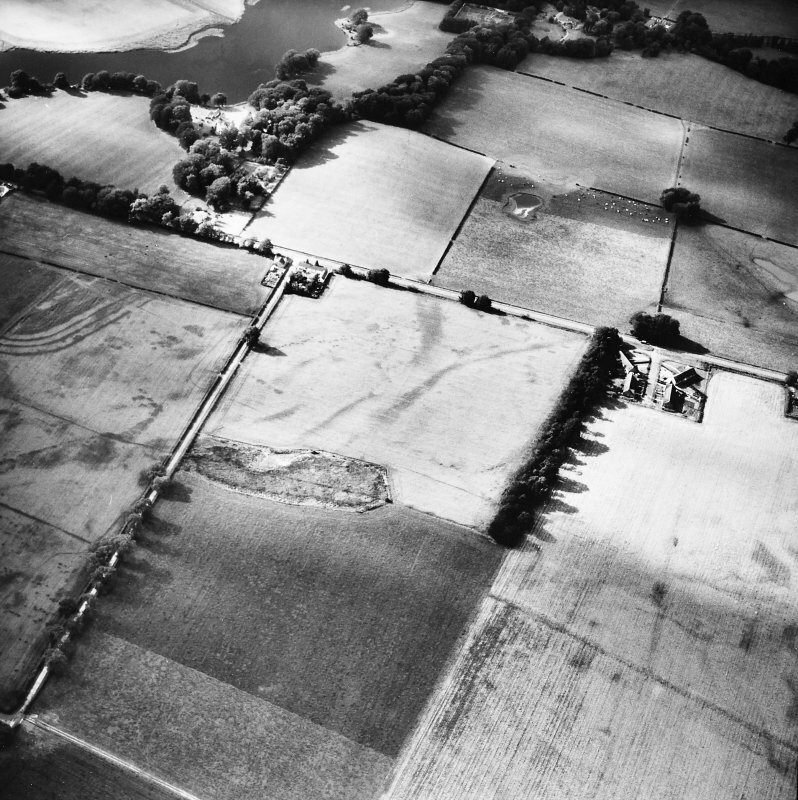 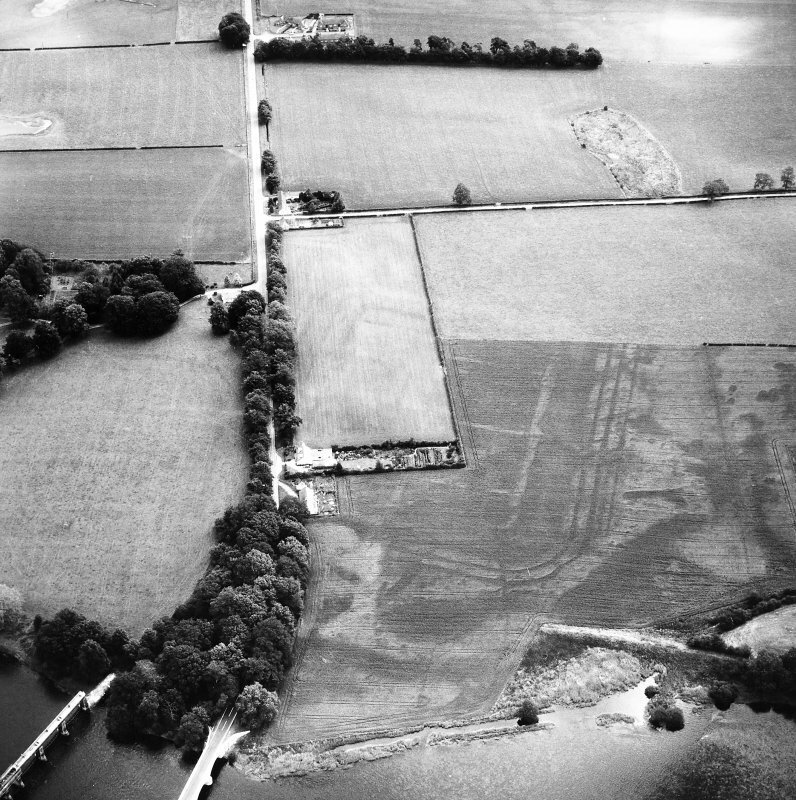 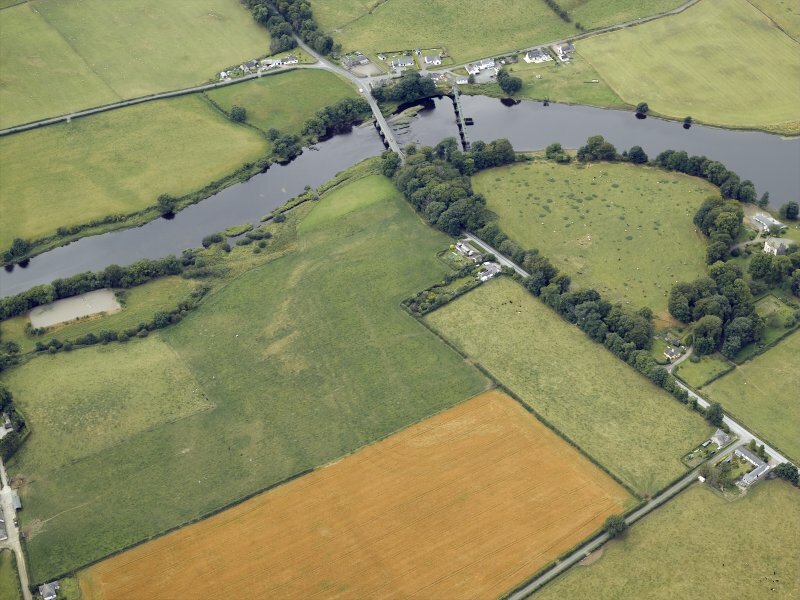 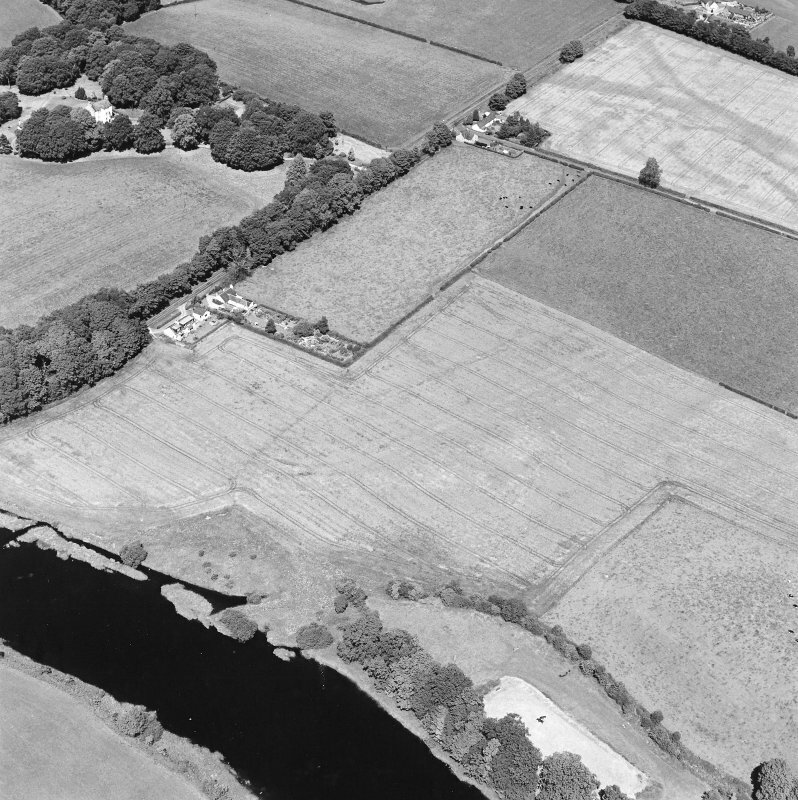 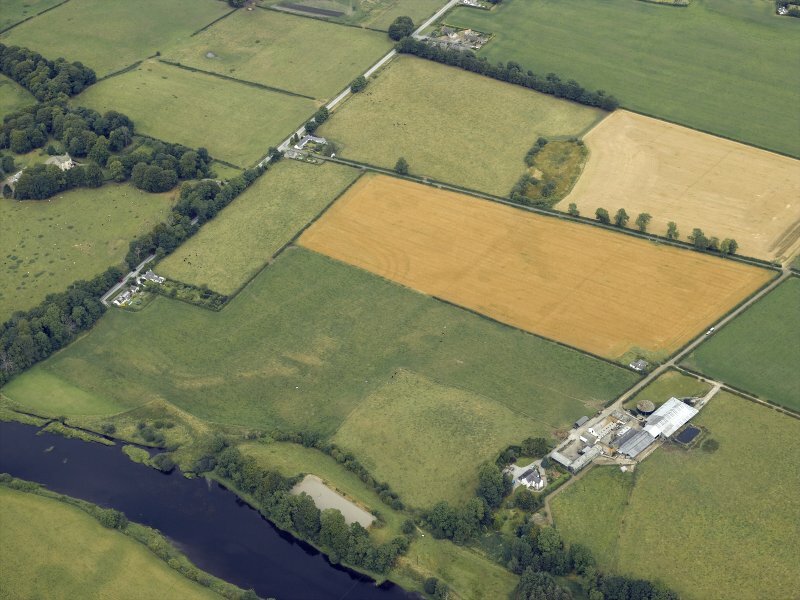 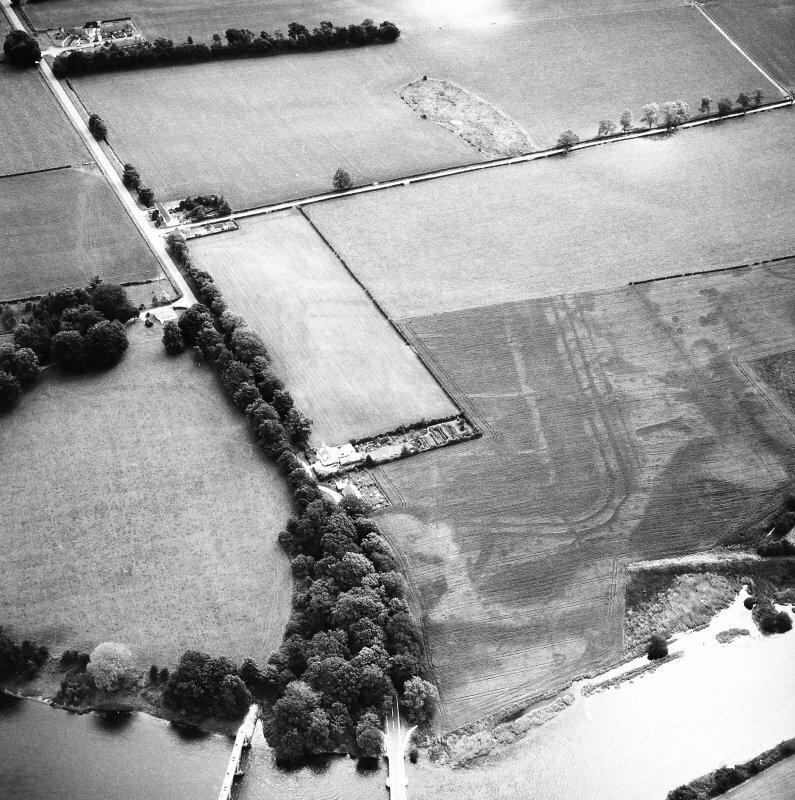 A cluster of camps, together with a Roman fort, were recorded from the air in the dry summer of 1949 on the east bank of the River Dee at Glenlochar by Kenneth St Joseph, a pioneer of aerial archaeology based at Cambridge University. 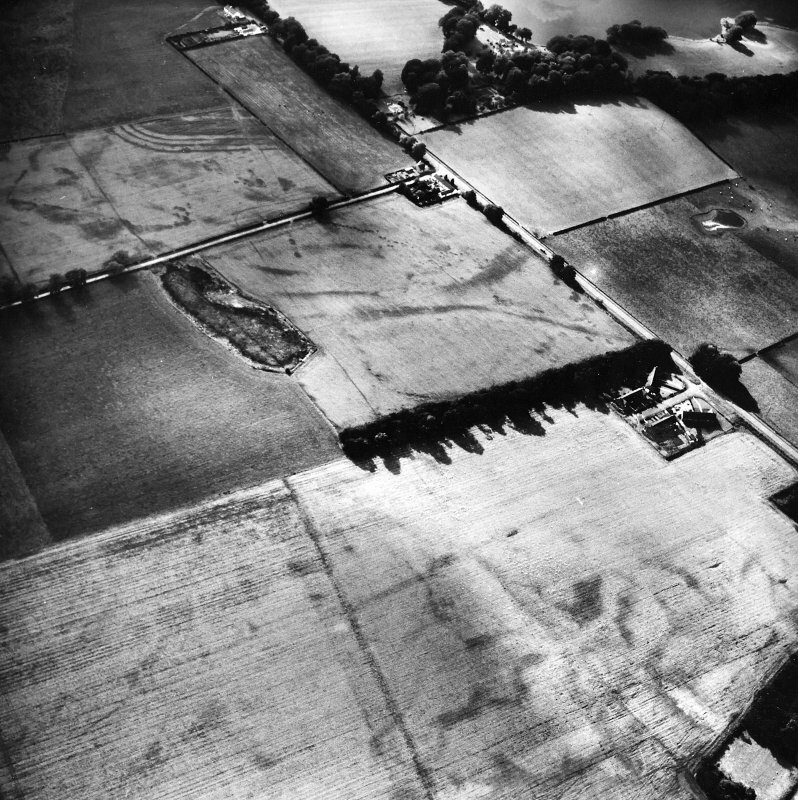 The buried remains of ditches reveal themselves as darker markings in the crops growing above, with lighter marks showing the roads within the fort, where crop growth is stunted by the stones below. 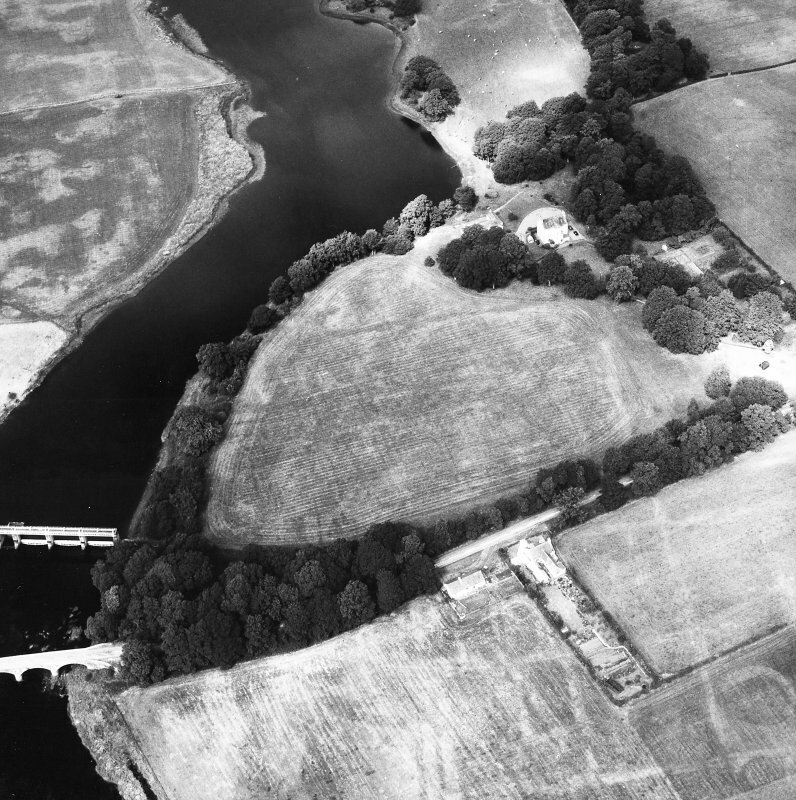 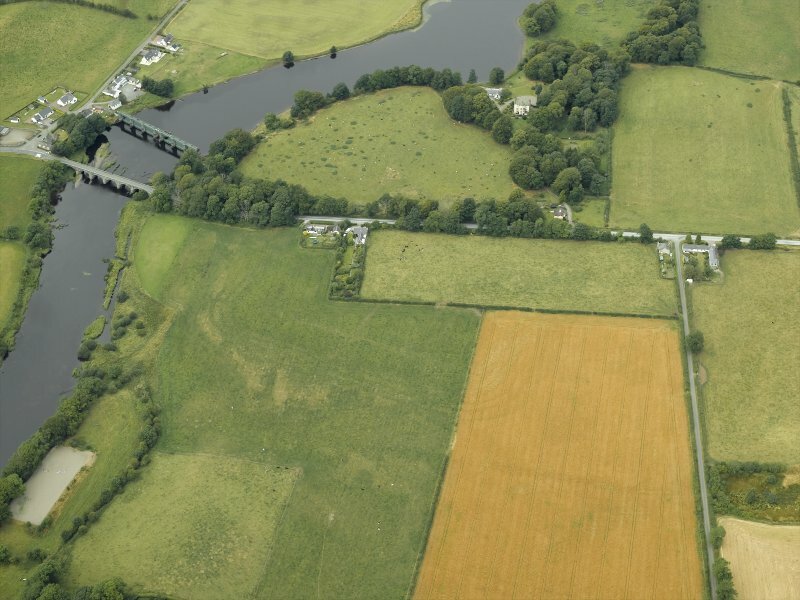 The site lies at a strategic point right next to the modern bridge (carrying the B 795 road) at one of the few suitable crossing points of the River Dee in this area. 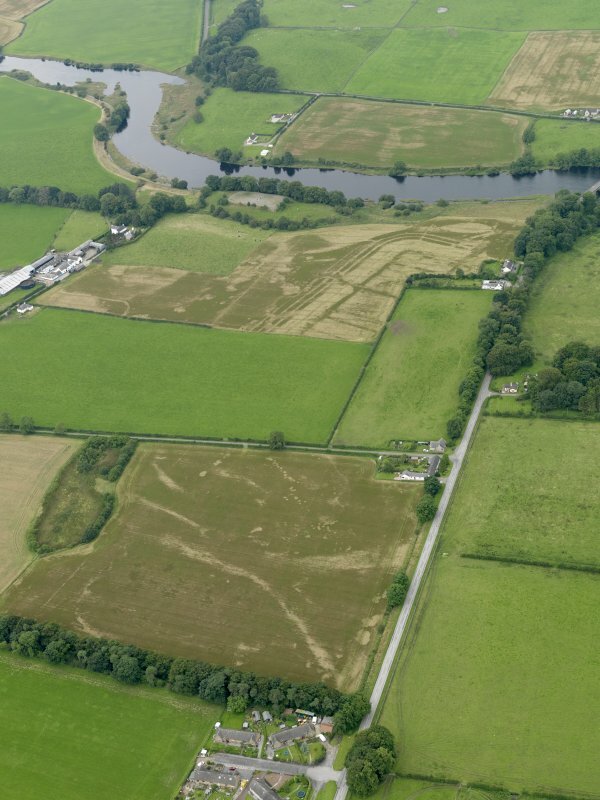 At least five camps surround the fort, further emphasing the importance of the location for the Roman army. 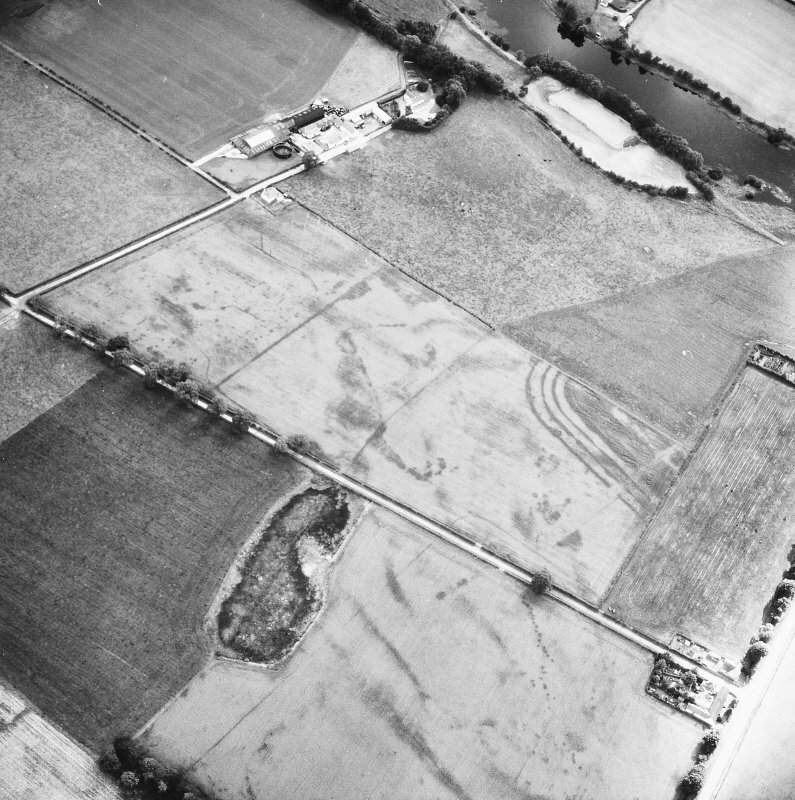 From the air, the familiar ‘playing-card’ shape of the fort can be seen, with multiple ditches around the outside and the gridded pattern of roads within. 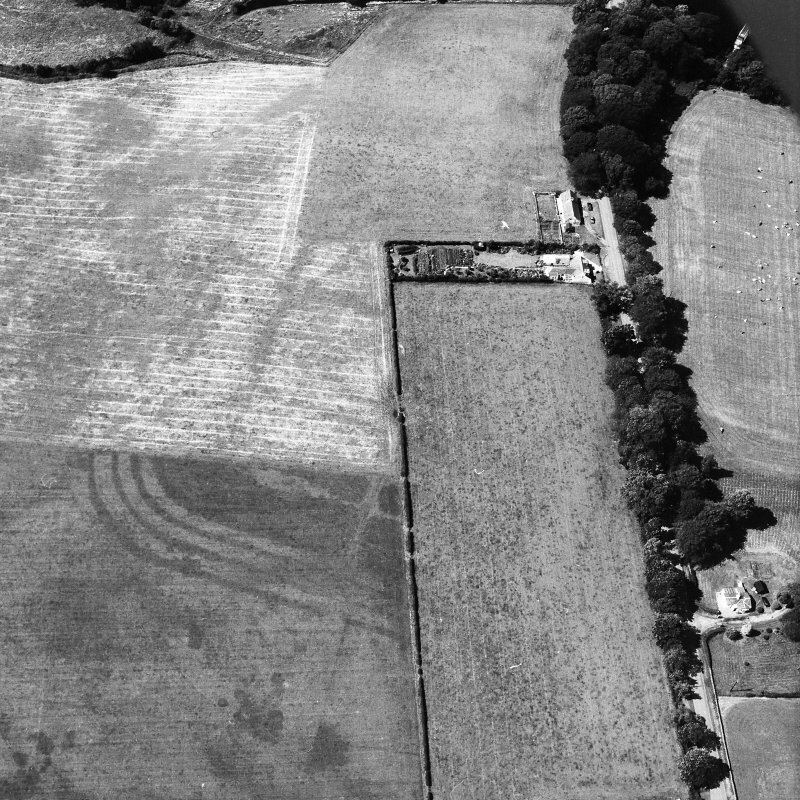 Lines of dark marks outside the fort to the east reveal the quarry-pits for the Roman road which connected this fort to other Roman bases in the south-west. 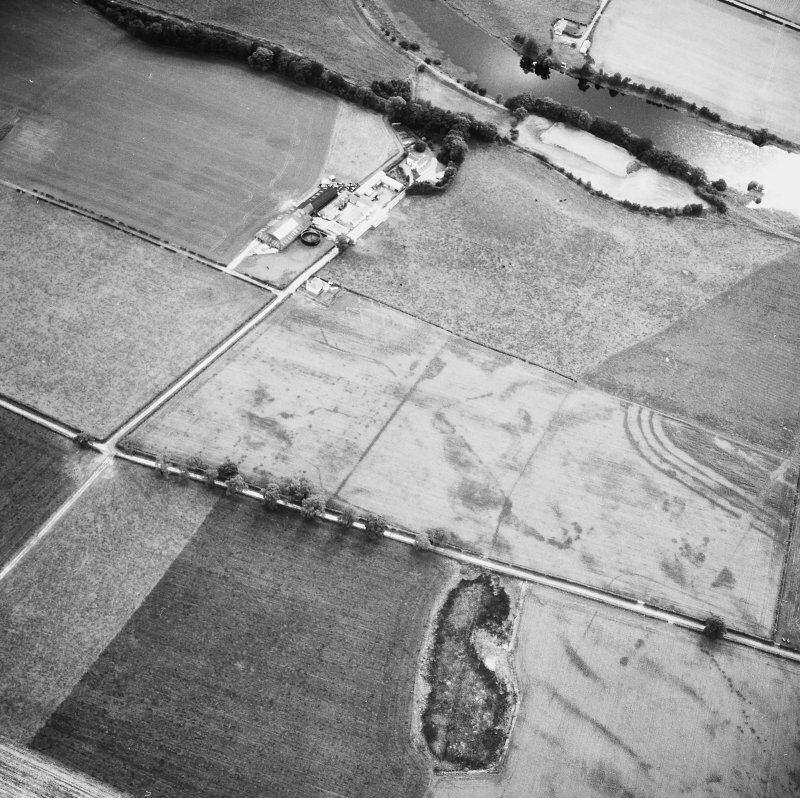 Small-scale trenches cut across the site in 1952 (this style of excavation was in vogue at the time), showed a 1st century fort (probably dating to the AD 70s) followed by later forts during the Antonine occupation of Scotland in the AD 140s-150s. 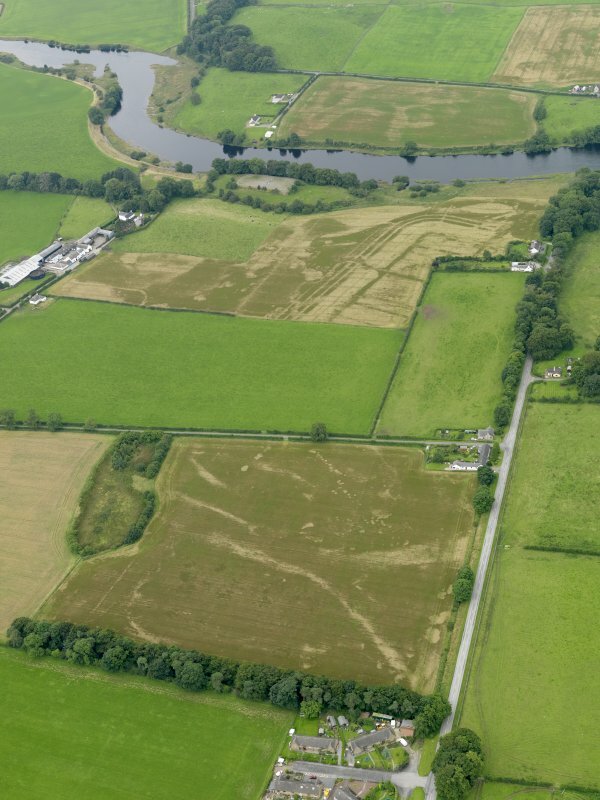 Whilst other Roman sites are suspected in the area, of note are the number of camps sited around the fort. 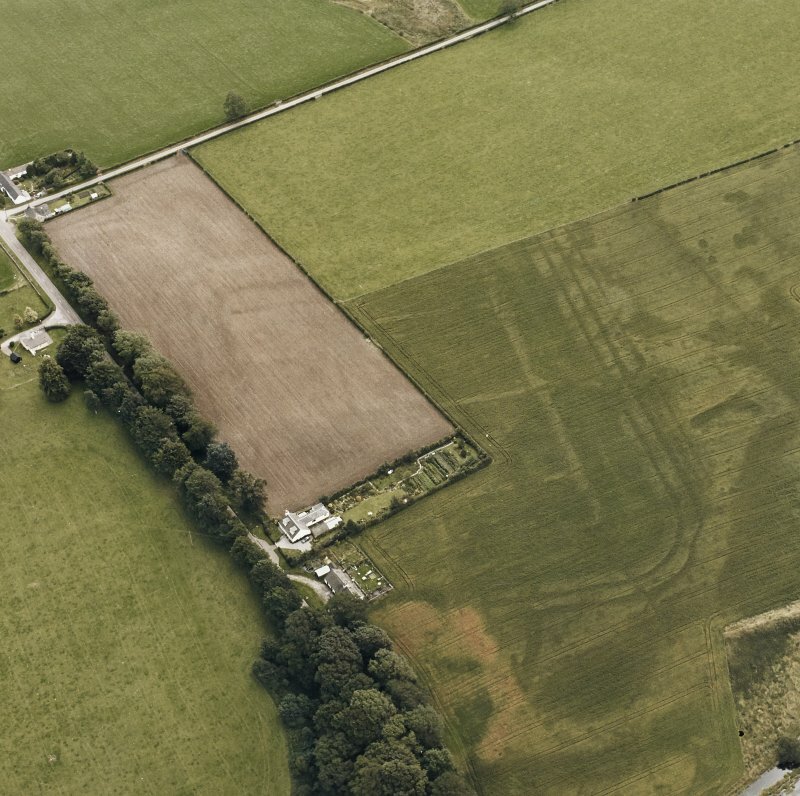 As some overlap one another and could not have been contemporary, they probably date to multiple Roman incursions in both the phases of campaigning in the 1st century as well as in the 2nd, and probably housed troops “on the march” in south-west Scotland. 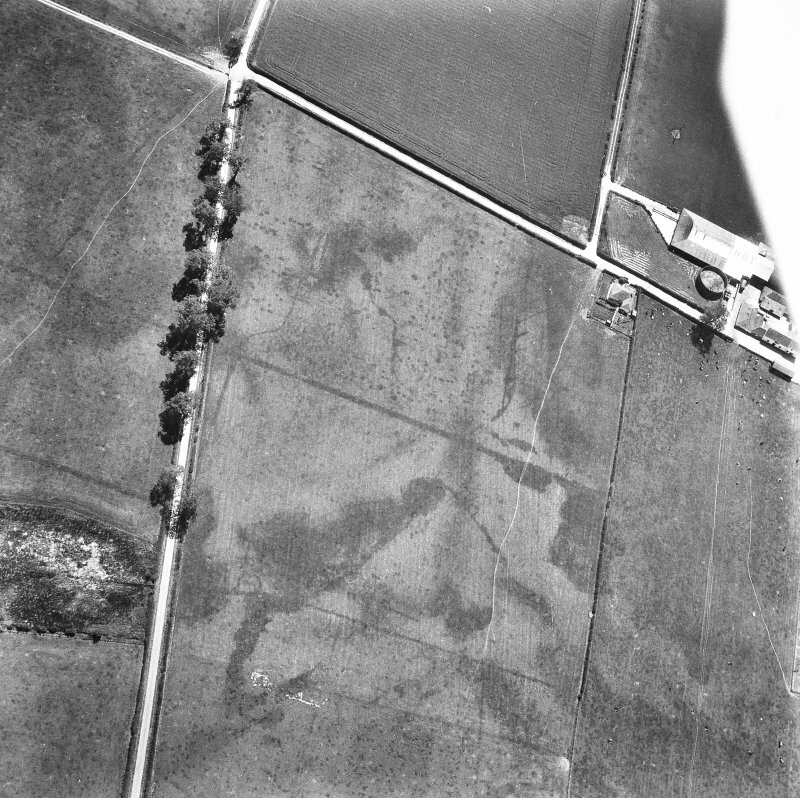 Marching camps usually reveal more on excavation and geophysical survey than they do from the air, but the southern-most camp displays a higgledy-piggledy array of dark marks in its interior. 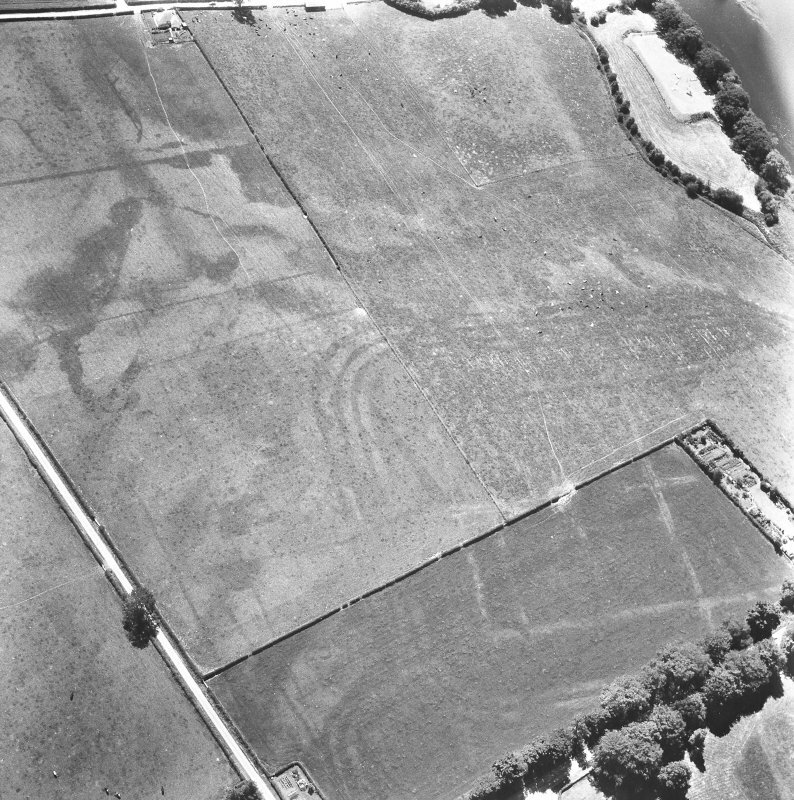 Evidence from other Roman camps would suggest that these were pits (including, potentially toilet-pits) and also Roman ovens. 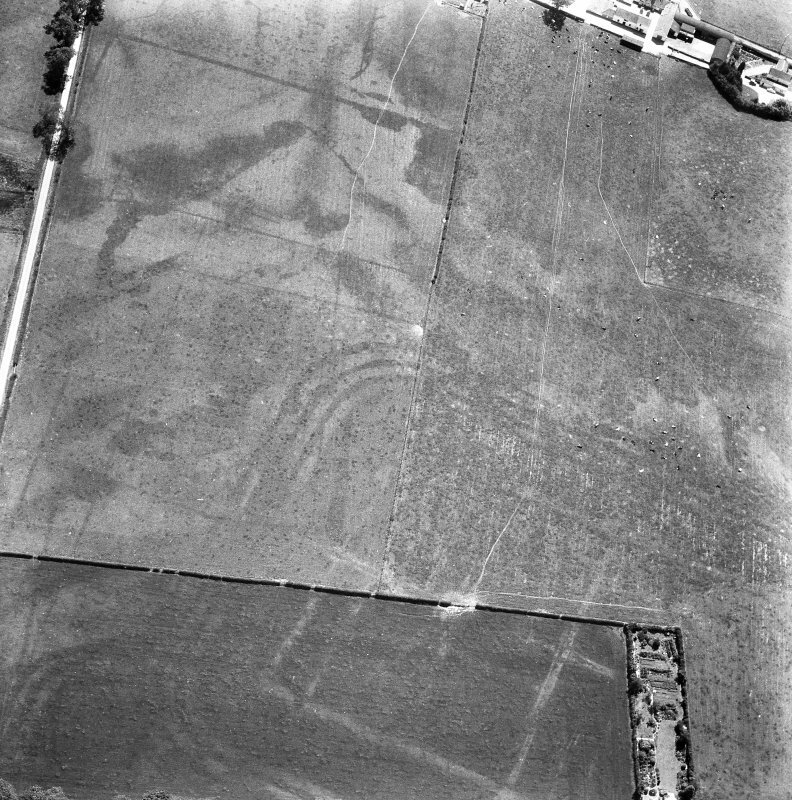 Some lines can be discerned in the remains, and these may hint at the location of rows of tents (the rubbish pits outside). 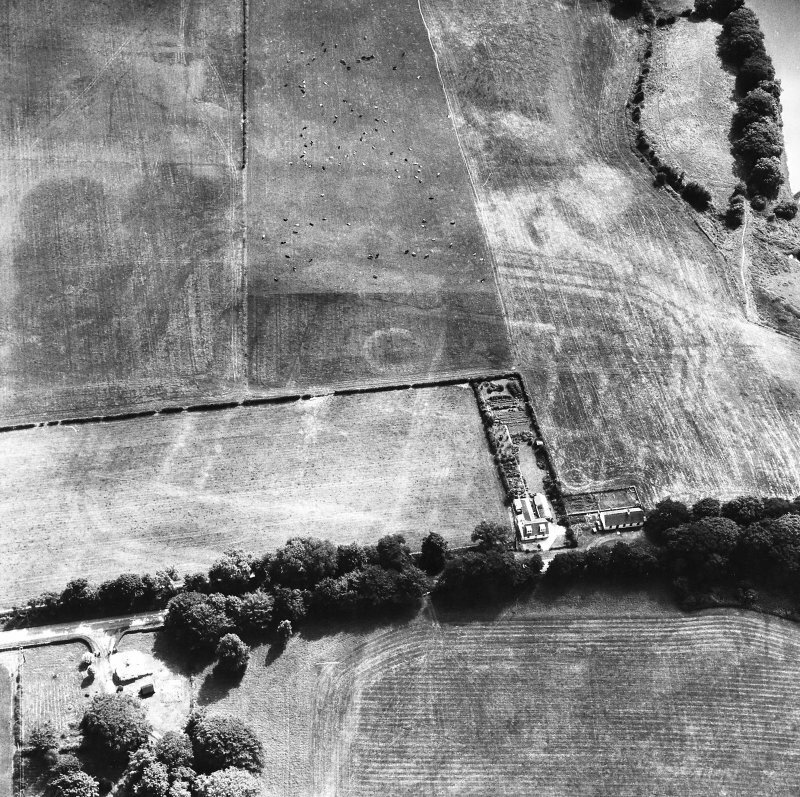 The two-week excavation in 1952 suggested that the first fort at Glenlochar was terminated through a ‘wholesale conflagration’. 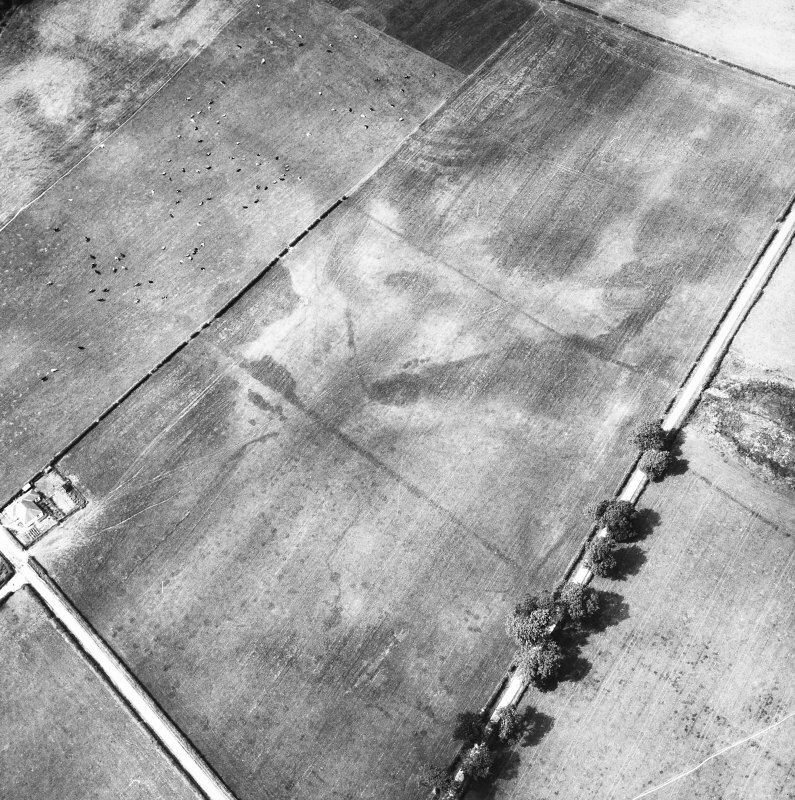 Whether this was as a result of Roman abandonment or enemy action is not possible to determine. 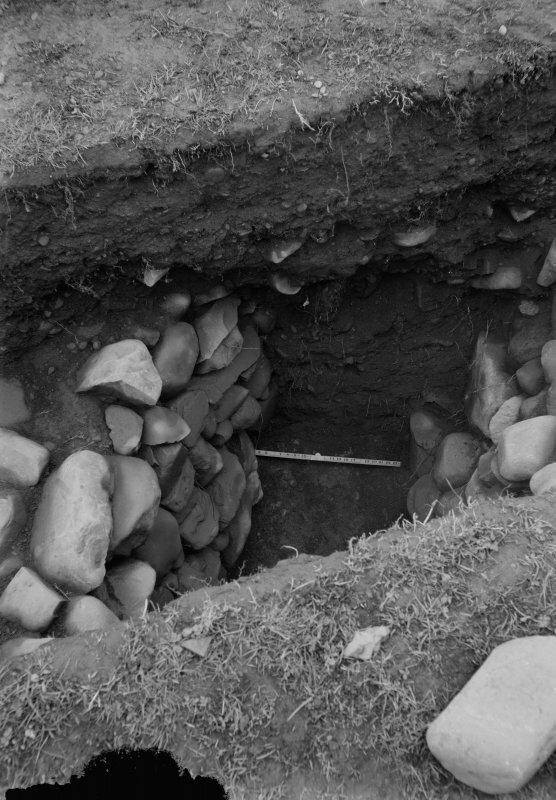 Glenlochar still has much to tell us about the Romans in south-west Scotland.